Indicate by check mark if the registrant is a well-known seasoned filer, as defined in Rule 405 of the Securities Act. Yes o No þ. Indicate by check mark whether the registrant is a shell company (as defined in Rule 12b-2 of the Act). Yes o No þ. As of March 28, 2015, the aggregate market share of the registrant’s voting stock held by non-affiliates of the registrant (based on the last sale price for such shares as quoted by the NYSE MKT was approximately $89.4 million. The number of outstanding shares of the registrant’s Common Stock as of November 20, 2015 was 7,747,579. Certain information required in Part III of this Form 10-K shall be incorporated from the registrant’s definitive Proxy Statement to be filed pursuant to Regulation 14A for the registrant’s 2015 Annual Meeting of Shareholders currently scheduled to be held on February 11, 2016. The Private Securities Litigation Reform Act of 1995 provides a safe harbor for forward-looking statements made by or on behalf of the Company. We may from time to time make written or oral statements that are “forward-looking,” including statements contained in this report and other filings with the Securities and Exchange Commission (the “SEC”), in our press releases, in oral statements, and in other reports to our shareholders. All statements, other than statements of historical fact, which address activities, events or developments that we expect or anticipate will or may occur in the future are forward-looking statements. The words “estimate”, “project”, “forecast”, “anticipate”, “expect”, “intend”, “believe” and similar expressions, and discussions of strategy or intentions, are intended to identify forward-looking statements. A detailed discussion of significant risk factors that have the potential to cause actual results to differ materially from our expectations is described in Part 1 under the heading of “Risk Factors.” Any forward-looking statements do not purport to be predictions of future events or circumstances and may not be realized. Further, any forward-looking statements are made only as of the date of this Annual Report and we do not undertake publicly to update or revise the forward-looking statements even if it becomes clear that any such statements or any projected results will not be realized or that any contemplated strategic initiatives will not be implemented. “Delta Apparel”, the “Company”, “we”, “us” and “our” are used interchangeably to refer to Delta Apparel, Inc. together with our domestic wholly-owned subsidiaries, including M.J. Soffe, LLC (“Soffe”), Junkfood Clothing Company (“Junkfood”), Salt Life, LLC (f/k/a To The Game, LLC) (“Salt Life”), Art Gun, LLC (“Art Gun”), and other international subsidiaries, as appropriate to the context. We were incorporated in Georgia in 1999 and our headquarters is located at 322 South Main Street, Greenville, South Carolina 29601 (telephone number: 864-232-5200). Our common stock trades on the NYSE MKT under the symbol “DLA”. We operate on a 52-53 week fiscal year ending on the Saturday closest to September 30. The 2015 fiscal year was a 53-week year that ended on October 3, 2015. The 2014 and 2013 fiscal years were 52-week years that ended on September 27, 2014, and June 29, 2013, respectively. The transition period resulting from the change in our fiscal year end was a 13-week quarter that ended on September 28, 2013, to coincide with the change in our fiscal year end. On August 26, 2013, our Board of Directors determined that the Company's fiscal year would begin on the Sunday closest to September 30th of each year and end on the Saturday closest to September 30th of each year. Delta Apparel, Inc. is an international apparel design, marketing, manufacturing and sourcing company that features a diverse portfolio of lifestyle basics and branded activewear apparel and headwear. We specialize in selling casual and athletic products through a variety of distribution channels and distribution tiers, including specialty stores, boutiques, department stores, mid and mass channels, e-retailers, and the U.S. military. Our products are also made available direct-to-consumer on our websites at www.saltlife.com, www.soffe.com, www.junkfoodclothing.com, and www.deltaapparel.com. We believe this diversified distribution allows us to capitalize on our strengths to provide casual activewear to consumers purchasing from most types of retailers. We became a diversified branded apparel company through acquisitions that added well-recognized brands and licensed properties to our portfolio, expanded our product offerings and broadened our distribution channels and customer base. On August 27, 2013, we purchased substantially all of the assets of Salt Life Holdings, LLC, including all of its domestic and international trademark rights in the Salt Life brand. The Salt Life acquisition continues our strategy of building lifestyle brands that take advantage of our creative capabilities, vertical manufacturing platform and international sourcing competencies. Prior to the Salt Life acquisition, we sold Salt Life-branded products under exclusive license agreements which began in January 2011. We operate our business in two distinct segments: branded and basics. Although the two segments are similar in their production processes and regulatory environments, they are distinct in their economic characteristics, products, marketing and distribution methods. The branded segment is comprised of our business units which are focused on specialized apparel garments and headwear to meet consumer preferences and fashion trends, and includes our Salt Life, Junkfood, and Soffe business units as well as The Game business unit prior to its disposition on March 2, 2015. These branded embellished and unembellished products are sold through specialty and boutique shops, upscale and traditional department stores, mid-tier retailers, sporting goods stores, e-retailers and the U.S. military. Products in this segment are marketed under our lifestyle brands of Salt Life®, Junk Food®, and Soffe®, as well as other labels. The basics segment is comprised of our business units primarily focused on garment styles characterized by low fashion risk, and includes our Delta Activewear (which includes Delta Catalog and FunTees) and Art Gun business units. We market, distribute and manufacture for sale unembellished knit apparel under the main brands of Delta Pro Weight® and Delta Magnum Weight® for sale to a diversified audience ranging from large licensed screen printers to small independent businesses. We also manufacture private label products for major branded sportswear companies, retailers, corporate industry programs, e-retailers, and sports licensed apparel marketers. Art Gun produces custom private label garments through digital printing. Typically the private label products are sold with value-added services such as hangtags, ticketing, hangers, and embellishment so that they are fully ready for retail. See Note 14 of the Notes to Consolidated Financial Statements for financial information regarding segment reporting, which information is incorporated herein by reference. We specialize in the design, merchandising, sales, and marketing of a variety of casual and athletic products for men, women, juniors, youth and children at a wide range of price points through most distribution channels. We market fashion apparel garments and headwear under our primary brands of Salt Life®, Junk Food®, and Soffe®, as well as other labels. We market our basic apparel garments under our Delta brand. Salt Life is an authentic, aspirational and lifestyle brand that embraces those who love the ocean and everything associated with it. From fishing, diving and surfing, to beach fun and sun-soaked relaxation, the Salt Life brand says "I live the Salt Life". Products consist of tee shirts, board shorts, technical fishing apparel, rash guards and performance clothing featuring our own trademarked UVAPOR fabrics. Salt Life's distribution includes surf shops, specialty stores, department stores and sporting goods retailers. Junk Food emerged in 1998 as the original vintage t-shirt brand. Known for its soft, comfortable fabrics and witty art, the Junk Food brand is a celebrity favorite carried in the top stores throughout the world, including branded collaborations with Bloomingdales, Nordstrom, Gap Inc. and other notable retailers. Also a licensing powerhouse, Junkfood has distribution rights to numerous pop-culture properties across multiple categories, including rock & roll, fictional characters, movies, sports, and foods and beverages. The Junk Food brand continues to expand beyond its iconic tee shirt collections with new apparel categories, accessories, and headwear. In fiscal year 2014, Junkfood opened its first flagship retail store on Abbot Kinney in Venice, California. Junkfood's diversified business model includes both private and branded labels, with a portfolio that includes Junk Food®, Junk Food Art House, Wknd, Stray Heart®, K-38, The Neighborhood Thieves®, Love + Art®, and True Vintage®. Soffe is currently positioned in the marketplace as an All-American lifestyle activewear brand that designs, produces, and markets products for men, women, juniors, and children. The women's offerings are grounded in the brand's heritage in the cheerleading market and include a newly introduced performance segment that utilizes technical fabrics as well as crossover fun-fashion influences. As a supplier to the military since 1946, the Soffe men's offerings are rooted in our military heritage. Core items include both contract-driven issued garments as well as branded basics that have become enlisted-soldier must-haves. Soffe also offers Intensity by Soffe, a uniform collection that outfits competitive athletes on-the-field. By incorporating trend-leading fits and an overall fashion-on-the-field sensibility, Intensity by Soffe creates performance uniforms, practice gear, and accessories. Soffe has a diverse distribution network that includes all military branches, big-box sporting goods retailers, mid-tier department stores, and an independent network of sales representatives that service independent sporting goods retailers, team dealers, screen printers, and schools. Delta offers a wide assortment of basic, high-quality apparel garments for the entire family under its primary brand names Delta Pro Weight® and Delta Magnum Weight®. Delta products are offered in a broad range of colors available in six-month infant to adult sizes up to 5X. The Pro Weight® line represents a diverse selection of mid-weight, 100% cotton silhouettes in a large color palette. The Magnum Weight® line is designed to give our customers a variety of silhouettes in a heavier-weight, 100% cotton fabric. In 2015, we launched a fleece program, which includes a fashionable, light-weight French terry line and a comfortable heavy-weight fleece. These unisex products help Delta meet the seasonal demands of our diversified customer base. New for 2016, we are adding trendy snow heathers to the fleece line, along with other fashion basics. FunTees designs, markets and manufactures private label custom knit t-shirts primarily to major branded sportswear companies. The majority of this merchandise is embellished and sold to our customers with a wide variety of packaging services so that products are shipped store-ready. Art Gun is a leader in direct-to-garment printing, with one of the most highly automated factory processes for delivering on-demand, direct-to-garment, digitally printed garments of all types. Art Gun prints single, custom items and ship products to consumers in over 40 countries worldwide. A key to the success of our businesses is our ability to anticipate and quickly respond to changing consumer preferences. Our art team reviews trend reports, concepts and color trends to keep our products and designs in style. This information is used by our in-house designers and merchandisers, along with our sales and marketing personnel, who review market trends, sales results and the popularity of our latest products to design new merchandise to meet the expected future demands of our consumers. We own several well-recognized trademarks that are important to our business. Salt Life® is an authentic, aspirational brand that embraces those who love the ocean and everything associated with living the "Salt Life". Soffe® has stood for quality and value in the athletic and activewear market for more than sixty years and Junk Food® has been known as a leading vintage t-shirt brand since 1998. Our other registered trademarks include Kudzu®, Pro Weight®, Magnum Weight®, the Delta Design, The Cotton Exchange®, Quail Hollow®, and Intensity Athletics®. Our trademarks are valuable assets that differentiate the marketing of our products. We vigorously protect our trademarks and other intellectual property rights against infringement. properties (including NASCAR), golf and various resort properties. Our license agreements are typically non-exclusive in nature and have terms that range from one to three years. Historically we have been able to renew our license agreements; however, the loss of certain license agreements could have a material adverse effect on our results of operations. Although we are not dependent on any single license, our license agreements collectively are of significant value to our branded segment. Our sales and marketing function consists of both employed and independent sales representatives and agencies located throughout the country. In our branded segment, sales teams service specialty and boutique, upscale and traditional department store, sporting goods and outdoor retailer, and military customer bases. We also have an international presence with our Junk Food® products in Canada, Europe, Asia, and Dubai. Our brands leverage both in-house and outsourced marketing communications professionals to amplify their lifestyle statements. In our basics segment, we sell our knit apparel products primarily direct to large and small screen printers and into the promotional products markets. Our private label products are sold primarily to major branded sportswear companies. During fiscal year 2015, we shipped our products to approximately 13,000 customers, many of whom have numerous retail "doors". No single customer accounted for more than 10% of sales in fiscal years 2015 and 2014, the transition period ended September 28, 2013, or fiscal year 2013, and our strategy is to not become dependent on any single customer. Revenues attributable to sales of our products in foreign countries, as a percentage of our consolidated net sales, represented approximately 2% in fiscal years 2015 and 2014, 4% in the transition period ended September 28, 2013, and 2% in fiscal year 2013. The majority of our apparel products are produced based on forecasts to permit quick shipments to our customers. Private label programs are generally made only to order or based on customer forecasts, and our headwear products are primarily sourced based on customer orders. We aggressively explore new ways to leverage our strengths and efficiencies to meet the quick-turn needs of our customers. We have distribution facilities strategically located throughout the United States that carry in-stock inventory for shipment to customers, with most shipments made via third party carriers. To better serve customers, we allow products to be ordered by the piece, dozen, or full case quantities. Because a significant portion of our business consists of at-once replenishment and direct catalog orders, we believe that backlog order levels do not provide a general indication of future sales. We have numerous competitors with respect to the sale of apparel and headwear products in domestic and international markets, many of which have greater financial resources than we do. We believe that competition within our branded segment is based primarily upon brand recognition, design, and consumer preference. We focus on sustaining the strong reputation of our brands by adapting our product offerings to changes in fashion trends and consumer preferences. We aim to keep our merchandise offerings fresh with unique artwork and new designs, and support the integrated lifestyle statement of our products through effective consumer marketing. We believe that our favorable competitive position stems from strong consumer recognition and brand loyalty, the high quality of our products, and our flexibility and process control, which drive product consistency. We believe that our ability to remain competitive in the areas of quality, price, design, marketing, product development, manufacturing, technology and distribution will, in large part, determine our future success. Competition in our basics business is generally based upon price, service, delivery time and quality, with the relative importance of each factor depending upon the needs of the particular customers and the specific product offering. This business is highly price competitive and competitor actions can greatly influence pricing and demand for our products. While price is still important in the private label market, quality and service are generally more important factors for customer choice. Our ability to consistently service the needs of our private label customers greatly impacts future business with these customers. Although our various product lines are sold on a year-round basis, the demand for specific products or styles reflects some seasonality, with sales in our June fiscal quarter typically being the highest and sales in our December fiscal quarter typically being the lowest. As we continue to expand our product offerings, the seasonality in our business has become less pronounced. The percentage of net sales by quarter for the year ended October 3, 2015, was 21%, 25%, 27% and 27% for the first, second, third, and fourth fiscal quarters, respectively. Consumer demand for apparel is cyclical and dependent upon the overall level of demand for soft goods, which may or may not coincide with the overall level of discretionary consumer spending. These levels of demand change as regional, domestic and international economic conditions change. Therefore, the distribution of sales by quarter in fiscal year 2015 may not be indicative of the distribution in future years. We have a vertically integrated manufacturing platform that supports both our branded and basics segments. Our manufacturing operations begin with the purchase of yarn and other raw materials from third-party suppliers. We manufacture fabrics in either our owned domestic textile facility located in Maiden, North Carolina or at Ceiba Textiles, our leased textile facility located near San Pedro Sula, Honduras. The manufacturing process continues at one of our seven apparel manufacturing facilities where the products are ultimately sewn into finished garments. We either own these facilities or lease and operate them. These facilities are located domestically (two in North Carolina) and internationally (two in Honduras, one in El Salvador and two in Mexico). Our garments may also be embellished and prepared for retail sale (with any combination of services, including ticketing, hang tags, and hangers). These facilities are located domestically (one in Florida and one in North Carolina) and internationally (one in El Salvador and one in Mexico). In fiscal years 2015 and 2014, the transition period ended September 28, 2013, and fiscal year 2013, approximately 84%, 81%, 85% and 81%, respectively, of our manufactured products were sewn in company-operated locations. The remaining products were sewn by outside contractors located primarily in the Caribbean Basin. At our 2015 and 2014 fiscal year-ends, the transition period ended September 28, 2013, and the 2013 fiscal year-end, our long-lived assets in Honduras, El Salvador and Mexico collectively comprised approximately 44%, 44%, 44%, and 42%, respectively, of our total net property, plant and equipment, with our long-lived assets in Honduras comprising 33%, 35%, 33%, and 31% , respectively. See Item 1A. Risk Factors for a description of risks associated with our operations located outside of the United States. To supplement our internal manufacturing platform, we purchase fabric, undecorated products and full-package products from independent sources throughout the world. In fiscal years 2015 and 2014, the transition period ended September 28, 2013, and fiscal year 2013, we sourced approximately 16%, 19%, 15% and 19%, respectively, of our products from third parties. We have a supply agreement with Parkdale Mills, Inc. and Parkdale America, LLC (collectively "Parkdale") to supply our yarn requirements until December 31, 2018. Under the supply agreement, we purchase from Parkdale all of our yarn requirements for use in our manufacturing operations, excluding yarns that Parkdale does not manufacture or cannot manufacture due to temporary capacity constraints. The purchase price of yarn is based upon the cost of cotton plus a fixed conversion cost. If Parkdale’s operations are disrupted and it is not able to provide us with our yarn requirements, we may need to obtain yarn from alternative sources. Although alternative sources are presently available, we may not be able to enter into short-term arrangements with substitute suppliers on terms as favorable as our current terms with Parkdale. In addition, the cotton futures we have fixed with Parkdale may not be transferable to alternative yarn suppliers. Because there can be no assurance that we would be able to pass along the higher cost of yarn to our customers, this could have a material adverse effect on our results of operations. We also purchase specialized fabrics that we currently do not have the capacity or capability to produce and may purchase other fabrics when it is cost-effective to do so. While these fabrics typically are available from various suppliers, there are times when certain yarns become limited in quantity, causing some fabrics to be difficult to source. This can result in higher prices or the inability to provide products to customers, which could negatively impact our results of operations. Dyes and chemicals are also purchased from several third party suppliers. While historically we have not had difficulty obtaining sufficient quantities of dyes and chemicals for manufacturing, the availability of products can change, which could require us to adjust dye and chemical formulations. In certain instances, these adjustments can increase manufacturing costs, negatively impacting our results of operations. As of October 3, 2015, we employed approximately 7,400 full time employees, of whom approximately 1,300 were employed in the United States. Approximately 1,200 employees at one of our facilities in San Pedro Sula, Honduras are party to a three-year collective bargaining agreement and approximately 1,400 employees at a separate facility in San Pedro Sula, Honduras are party to a three-year collective bargaining agreement. We have historically conducted our operations without significant labor disruptions and believe that our relations with our employees are good. We have invested significant time and resources in attempting to cause the working conditions in all of our facilities to meet or exceed the standards imposed by governing laws and regulations. We have obtained WRAP (Worldwide Responsible Accredited Production) certification for all of our manufacturing facilities that we operate in Honduras, El Salvador and Mexico and for our Maiden, North Carolina facility in the United States. Delta Apparel, Inc., along with all of its affiliated businesses, is a participating company of the FLA (Fair Labor Association). This affiliation with FLA further enhances human rights compliance monitoring for our plants and our third party contractors. In addition, we have proactive programs to promote workplace safety, personal health, and employee wellness. We also support educational institutions and charitable organizations in the communities where we operate. We are subject to various federal, state and local environmental laws and regulations concerning, among other things, wastewater discharges, storm water flows, air emissions and solid waste disposal. Our plants generate small quantities of hazardous waste, which are either recycled or disposed of off-site. Several of our plants are required to possess one or more environmental permits, and we believe that we are currently in compliance with the requirements of these permits. can be no assurance, however, that future changes in federal, state, or local regulations, interpretations of existing regulations or the discovery of currently unknown problems or conditions will not require substantial additional expenditures. Similarly, while we believe that we are currently in compliance with all applicable environmental requirements, the extent of our liability, if any, for past failures to comply with laws, regulations and permits applicable to our operations cannot be determined and could have a material adverse effect on our operations, financial condition and liquidity. Although we continually seek new products and brands to take to market via our diverse distribution network and customer base, there were no material amounts expended on research and development in the fiscal year ended October 3, 2015. Our corporate internet address is www.deltaapparelinc.com. We make available free of charge on our website our SEC reports, including our Annual Reports on Form 10-K, Quarterly Reports on Form 10-Q, Current Reports on Form 8-K, Section 16 filings and any amendments to those reports, as soon as reasonably practicable after we electronically file such material with, or furnish it to, the SEC. The information found on our website is not part of this, or any other, report that we file with or furnish to the SEC. In addition, we will provide upon request, at no cost, paper or electronic copies of our reports and other filings made with the SEC. Requests should be directed to: Investor Relations Department, Delta Apparel, Inc., 322 South Main Street, Greenville, South Carolina 29601. Requests can also be made by telephone to 864-232-5200 extension 6621, or via email at investor.relations@deltaapparel.com. We operate in a rapidly changing, highly competitive business environment that involves substantial risks and uncertainties, including, but not limited to, the risks identified below. The following risks, as well as risks described elsewhere in this report or in our other filings with the SEC, could materially affect our business, financial condition or operating results and the value of Company securities held by investors and should be carefully considered in evaluating our Company and the forward-looking statements contained in this report or future reports. The risks described below are not the only risks facing Delta Apparel. Additional risks not presently known to us or that we currently do not view as material may become material and may impair our business operations. Any of these risks could cause, or contribute to causing, our actual results to differ materially from expectations. We expressly disclaim any obligation to publicly update or revise any risk factors, whether as a result of new information, future events or otherwise, except as required by law. The price and availability of purchased yarn and other raw materials is prone to significant fluctuations and volatility. Cotton is the primary raw material used in the manufacture of our apparel products. As is the case with other commodities, the price of cotton fluctuates and is affected by weather, consumer demand, speculation on the commodities market, and other factors that are generally unpredictable and beyond our control. As described under the heading “Raw Materials”, the price of yarn purchased from Parkdale, our key supplier, is based upon the cost of cotton plus a fixed conversion cost. We set future cotton prices with purchase commitments as a component of the purchase price of yarn in advance of the shipment of finished yarn from Parkdale. Prices are set according to prevailing prices, as reported by the New York Cotton Exchange, at the time we enter into the commitments. Thus, we are subject to the commodity risk of cotton prices and cotton price movements, which could result in unfavorable yarn pricing for us. The Company and the apparel industry as a whole experienced unprecedented increases in cotton prices and price volatility during the fiscal year ended June 30, 2012. We were unable to pass through to our customers this higher cost of cotton and ultimately decided to take a $16.2 million inventory write-down in our basics segment in the second quarter of our 2012 fiscal year. This second quarter inventory write-down was the primary factor in the Company's net loss for fiscal year 2012. In addition, if Parkdale’s operations are disrupted and Parkdale is not able to provide us with our yarn requirements, we may need to obtain yarn from alternative sources. We may not be able to enter into short-term arrangements with substitute suppliers on terms as favorable as our current terms with Parkdale, which could negatively affect our business. Current economic conditions may adversely impact demand for our products. The apparel industry is cyclical and dependent upon the overall level of demand for soft goods, which may or may not coincide with the overall level of discretionary consumer spending. These levels of demand change as regional, domestic and international economic conditions change. These economic conditions include, but are not limited to, employment levels, energy costs, interest rates, tax rates, inflation, personal debt levels, and uncertainty about the future, with many of these factors outside of our control. Overall, consumer purchases of discretionary items tend to decline during recessionary periods when disposable income is lower. As such, deterioration in general economic conditions that creates uncertainty or alters discretionary consumer spending habits could reduce our sales. Sometimes, however, the timing of increases or decreases in consumer purchases of soft goods can differ from the timing of increases or decreases in the overall level of economic activity. Weakening sales may require us to reduce manufacturing operations to match our output to demand or expected demand. Reductions in our manufacturing operations may increase unit costs and lower our gross margins, causing a material adverse effect on our results of operations. The apparel industry is highly competitive, and we face significant competitive threats to our business. The market for athletic and activewear apparel and headwear is highly competitive and includes many new competitors as well as increased competition from established companies, some of which are larger or more diversified and may have greater financial resources than we do. Many of our competitors have competitive advantages, including larger sales forces, better brand recognition among consumers, larger advertising budgets, and greater economies of scale. If we are unable to compete successfully with our competitors, our business and results of operations will be adversely affected. We may be restricted in our ability to borrow under our revolving credit facility or service our indebtedness. Significant operating losses or significant uses of cash in our operations could cause us to default on our asset-based revolving credit facility. We rely on our credit facility, as well as on cash generated by our operations, to fund our working capital and capital expenditure needs, to make acquisitions, to fund share repurchases under our Stock Repurchase Program and to pay dividends should we choose to do so in the future. Our working capital needs are generally greater in advance of the spring and summer selling seasons. Availability under our credit facility is primarily a function of the levels of our accounts receivable and inventory, as well as the uses of cash in our operations. A significant deterioration in our accounts receivable or inventory levels could restrict our ability to borrow additional funds or service our indebtedness. Moreover, our credit facility includes a financial covenant that if the availability under our credit facility falls below the amounts specified in our credit agreement, our Fixed Charge Coverage Ratio (“FCCR”) (as defined in our credit agreement) for the preceding 12-month period must not be less than 1.1 to 1.0. Although our availability at October 3, 2015, was above the minimum thresholds specified in our credit agreement, a significant deterioration in our business could cause our availability to fall below such thresholds, thereby requiring us to maintain the minimum FCCR specified in our credit agreement. Our credit facility also includes customary conditions to funding, representations and warranties, covenants, and events of default. The covenants include, among other things, limitations on asset sales, consolidations, mergers, liens, indebtedness, loans, investments, guaranties, acquisitions, dividends, stock repurchases, and transactions with affiliates. If an event of default under our credit facility occurred or became imminent, we may request our credit agreement lenders to provide a waiver. If we were unsuccessful in that endeavor, we could explore alternative sources of capital, whether debt or equity, which would likely be more expensive than the costs we incur under our credit facility. If we were unable to cure an un-waived event of default under our credit facility, we would be unable to borrow additional amounts under the facility, we could be unable to make acquisitions as well as fund share repurchases and pay dividends, and our lenders thereunder could accelerate our obligations under the agreement and foreclose on our assets subject to the liens in their favor. This circumstance would materially adversely affect our financial position and results of operations. The inability to successfully implement certain strategic initiatives could adversely affect our financial position and results of operations. In response to our financial performance and results of operations during our 2014 fiscal year, as well as our near-term view of apparel market conditions at the time, we initiated a reorganization of our administrative structure at all levels to streamline decision-making and information flow as well as reduce duplicative and excess fixed costs. In addition, on March 2, 2015, we sold our The Game branded collegiate headwear and apparel business and we continue to evaluate other strategic initiatives focused on improving net profitability. These other initiatives include, among other things, (i) further restructuring our manufacturing platform to lower product costs and strategically reduce capacity on certain product lines, and (ii) a comprehensive rationalization of all business units, product lines and sales channels. The failure or inability to carry out any of these initiatives, any unexpected increases in the costs to carry out any of these initiatives, or the failure to achieve the cost savings or other financial or performance benefits expected from any of these initiatives could have a material adverse effect on our financial position or results of operations. Deterioration in the financial condition of our customers or suppliers and changes in the operations and strategies of our customers or suppliers could adversely affect our financial position and results of operations. We extend credit to our customers, generally without requiring collateral. The extension of credit involves considerable judgment and is based on an evaluation of each customer’s financial condition and payment history. We monitor credit risk exposure by periodically obtaining credit reports and updated financial statements on our customers. Deterioration in the economy, declines in consumer purchases of apparel, or disruption in the ability of our customers to access liquidity could have an adverse effect on the financial condition of our customers. During the past several years, various retailers and other customers have experienced significant difficulties, including restructurings, bankruptcies and liquidations. The inability of these retailers and other customers to overcome these difficulties may increase due to the current worldwide economic conditions. We maintain an allowance for doubtful accounts for potential credit losses based upon current conditions, historical trends, estimates and other available information. The size of this allowance is the result of our making judgments and determinations in the context of imperfect information, and in retrospect the allowance may turn out to have been insufficient. The inability to collect on sales to significant customers or a group of customers could have a material adverse effect on our financial condition and results of operations. Significant changes in the financial condition of any of our suppliers or other parties with which we do business could result in disruption to our business and have a material adverse effect on our financial condition and results of operations. In addition, significant changes in the retail or operational strategies employed by our customers may result in decreased sales of our products to such customers and could have a material adverse effect on our financial condition and results of operations. Likewise, significant changes in the operations of any of our suppliers or other parties with which we do business could result in disruption to our business and have a material adverse effect on our financial condition and results of operations. Our success depends, in part, on our ability to predict or effectively react to changing consumer preferences and trends. The success of our businesses depends on our ability to anticipate and respond quickly to changing consumer demand and preferences in apparel and headwear. We believe that our brands are recognized by consumers across many demographics. The popularity, supply and demand for particular products can change significantly from year to year based on prevailing fashion trends (particularly in our branded business) and on other factors and, accordingly, our ability to adapt to fashion trends in designing products is important to the success of our brands. If we are unable to quickly adapt to changes in consumer preferences in the design of products, our results of operations could be adversely affected. Moreover, because we and our customers project demand for our products based on estimated sales and fashion trends, the actual demand for our products sometimes falls short of what was projected. This can lead to higher inventory levels than desired. Excess inventory levels increase our working capital needs, and sometimes excess inventory must be sold at discounted prices, all of which could have an adverse impact on our business, financial condition and results of operations. Our basics segment is subject to significant pricing pressures which may decrease our gross profit margins if we are unable to implement our cost reduction strategies. We operate our basics segment in a highly competitive, price sensitive industry. Our strategy in this market environment is to be a low-cost producer and to differentiate ourselves by providing quality products and value-added services to our customers. To help achieve this goal, we began production in Ceiba Textiles, our Honduran textile facility, in fiscal year 2008. In the fourth quarter of fiscal year 2009, we closed our Soffe textile manufacturing facility in Fayetteville, North Carolina and moved this production to our Maiden, North Carolina and Ceiba Textiles plants. In fiscal year 2010, we began the expansion of Ceiba Textiles to increase internal manufacturing capacity and further leverage the fixed cost of the facility, and the expansion of manufacturing operations at that facility has continued in subsequent years. In fiscal year 2012, we moved several functions of our private label business to our El Salvador facility to better serve customers through an enhanced and efficient product development process. In conjunction with this, we began a modernization of our decoration equipment to expand capabilities and lower costs. In addition, we announced in 2013 the consolidation of our domestic screen print operations as part of our continued focus on more efficient manufacturing and distribution strategies. This consolidation resulted in the closing of the Wendell, North Carolina decoration facility operated by our Soffe business unit and the consolidation of those operations within Soffe's Fayetteville, North Carolina facility. Further, in June 2014, we announced plans to consolidate some domestic fabric production for our basic, blank t-shirt products into our Ceiba Textiles facility in Honduras and subsequently made investments intended to modernize and provide more flexibility within that manufacturing platform. These initiatives, along with continual improvements in our production and delivery of products, are expected to lower our product costs and improve our results of operations. However, any unexpected increases in the costs to carry out these initiatives or the failure to achieve the cost savings expected from these initiatives could have a material adverse effect on our results of operations. Our operations are subject to political, social, economic, and climate risks in Honduras, El Salvador and Mexico. The majority of our products are manufactured in Honduras, El Salvador and Mexico, with a concentration in Honduras. These countries from time to time experience political, social and economic instability, and we cannot be certain of their future stability. Instability in a country can lead to protests, riots and labor unrest. New government leaders can change employment laws, thereby increasing our costs to operate in that country. In addition, fire or natural disasters, such as hurricanes, earthquakes, or floods can occur in these countries. Any of these political, social, economic or climatic events or conditions could disrupt our supply chain or increase our costs, adversely affecting our financial position and results of operations. Our success depends upon the talents and continued contributions of our key management. We believe our future success depends on our ability to retain and motivate our key management, our ability to attract and integrate new members of management into our operations and the ability of all personnel to work together effectively as a team. Our success is dependent in significant part on our ability to retain existing, and attract additional, qualified personnel to execute our business strategy. Our business is influenced by weather patterns. Our business is susceptible to unseasonable weather conditions. For example, extended periods of unusually warm temperatures during the winter season or cooler weather during the spring and summer seasons could render portions of our inventory incompatible with weather conditions and influence consumers to alter their apparel purchasing habits. Reduced sales volumes from extreme or prolonged unseasonable weather conditions could adversely affect our business and results of operations. We currently pay income taxes at lower than statutory rates and may incur additional tax liability. We are subject to income tax in the United States and in foreign jurisdictions in which we generate net operating profits. We benefit from a lower overall effective income tax rate due to the majority of our manufacturing operations being located in foreign tax-free locations. Our U.S. legal entity contracts with our foreign subsidiaries to manufacture products on its behalf, with the intercompany prices paid for the manufacturing services and manufactured products based on an arms-length standard and supported by an economic study. We have concluded that the profits earned in the tax-free locations will be considered permanently reinvested. Thus, no U.S. deferred tax liability is recorded on these profits, causing our effective tax rate to be significantly below U.S. statutory rates. Our effective tax rate could be adversely affected by changes in the mix of earnings between the U.S. and tax-free foreign jurisdictions. In addition, changes to U.S. tax laws impacting how U.S. multinational corporations are taxed on foreign earnings or a need or requirement for us to remit tax-free earnings back to the U.S. could also have a material adverse effect on our tax expense and cash flow. Our variable rate debt subjects us to interest rate risk that could cause our debt service obligations to increase significantly. The debt we incur under our asset-based revolving credit facility is at variable rates of interest, which exposes us to interest rate risk. If interest rates increase, our obligations on this variable rate indebtedness would increase even though the amount borrowed remained the same, and there would be a corresponding decrease in our net income and cash flows, including cash available for servicing our debt. We may need to raise additional capital to grow our business. The rate of our growth, especially through acquisitions, depends, in part, on the availability of debt and equity capital. We may not be able to raise capital on terms acceptable to us or at all. If new sources of financing are required, but are insufficient or unavailable, we may be required to modify our growth and operating plans based on available funding, which could adversely affect our ability to grow the business. We have expanded our business through acquisitions that could result in diversion of resources, an inability to integrate acquired operations and extra expenses. A part of our growth strategy has involved acquiring businesses that complement our existing business. The negotiation of potential acquisitions and integration of acquired businesses could divert our management’s attention from our existing businesses, which could negatively impact our results of operations. In addition, if the integration of an acquired business is not successful or takes significantly longer than expected, or if we are unable to realize the expected benefits from an acquired business, it could adversely affect our financial condition and results of operations. The price of energy and fuel costs are prone to significant fluctuations and volatility, which could adversely affect our results of operations. Our manufacturing operations require high inputs of energy, and therefore changes in energy prices directly impact our gross profits. In addition, we incur significant freight costs to transport goods between the United States and our offshore facilities, along with transportation expenses to ship products to our customers. The cost of energy and fuel fluctuates due to a number of factors outside of our control, including government policy and regulation and weather conditions. We continue to focus on manufacturing methods that will reduce the amount of energy used in the production of products to mitigate risks of fluctuations in the cost of energy. In addition, we enter into forward contracts to fix a portion of our expected natural gas requirements for delivery in the future in order to mitigate potential increases in costs. However, significant increases in energy and fuel prices may make us less competitive compared to others in the industry, which may have a material adverse effect on our financial position and results of operations. Our business operations rely on our information systems and any material disruption or slowdown of our systems could cause operational delays. We depend on information systems to manage our inventory, process transactions, respond to customer inquiries, purchase, sell and ship goods on a timely basis and maintain cost-effective operations. We have invested significant capital and expect future capital expenditures associated with the integration of our information technology systems across our businesses. This process involves the replacement and consolidation of technology platforms so our businesses are served by fewer platforms, resulting in operational efficiencies and reduced costs. Our inability to effectively convert our operations to the new systems could cause delays in product fulfillment and reduced efficiency in our operations. In addition, we may experience operational problems with our information systems as a result of system failures, "cyber attack", computer viruses, security breaches, disasters or other causes. Any material disruption or slowdown of our information systems could cause operational delays that could have a material adverse effect on our business and results of operations. Data security and privacy breaches could lead to liability and reputational damage. Our business involves the regular collection and use of sensitive and confidential information regarding customers and employees. These activities are subject to contractual requirements and are highly regulated. Privacy and information security laws are complex and constantly changing. Compliance with these laws and regulations may result in additional costs due to new systems and processes, and our non-compliance could lead to legal liability. Further, the methods used by third parties to obtain unauthorized access change frequently and may not be anticipated or immediately detected. Thus, despite the security measures we may have in place, an actual or perceived information security breach, whether due to "cyber attack", computer viruses or human error, could occur. Such a breach of customer, employee or company data could attract media attention, damage our customer or other business relationships and reputation, result in lost sales, fines, lawsuits or other costs and involve the loss of confidential company information, any or all of which could have a material adverse effect on our business, financial condition and results of operations. Our business could be harmed if we are unable to deliver our products to the market due to casualty or other problems with our manufacturing operations or distribution network. We own or lease manufacturing facilities in the United States, Honduras, Mexico and El Salvador. We also own or lease distribution facilities located throughout the United States and maintain inventory at third-party distribution facilities in the United States. Any casualty or other circumstance that damages or destroys any of these material facilities or significantly limits their ability to function could materially affect our business in an adverse way. Similarly, any significant interruption in the operation of any of these facilities or our related sourcing and transportation logistics functions, whether within or outside of our control, may delay shipment of merchandise to our customers, potentially damaging our reputation and customer relationships and causing a loss of revenue. In addition, if we are unable to successfully coordinate the planning of inventory across these facilities and the related distribution activities, it could have a material adverse effect on our business, financial condition and results of operations. Failure of our operations to comply with safety, health and environmental regulations could have a material adverse effect on our financial position and results of operations. Our operations must meet extensive federal, state and local regulatory standards in the areas of safety, health and environmental pollution controls. There can be no assurance that interpretations of existing regulations, future changes in existing laws, or the enactment of new laws and regulations will not require substantial additional expenditures. Although we believe that we are in compliance in all material respects with existing regulatory requirements in these areas, the extent of our liability, if any, for the discovery of currently unknown problems or conditions, or past failures to comply with laws, regulations and permits applicable to our operations, cannot be determined and could have a material adverse effect on our financial position and results of operations. We are subject to periodic litigation in both domestic and international jurisdictions that may adversely affect our financial position and results of operations. From time to time we may be involved in legal or regulatory actions regarding product liability, employment practices, intellectual property infringement, bankruptcies and other litigation. Due to the inherent uncertainties of litigation in both domestic and foreign jurisdictions, we cannot accurately predict the ultimate outcome of any such proceedings. These proceedings could cause us to incur costs and may require us to devote resources to defend against these claims and could ultimately result in a loss or other remedies such as product recalls, which could adversely affect our financial position and results of operations. For a description of current material legal proceedings, see Part I, Item 3, Legal Proceedings. We rely on the strength of our trademarks and could incur significant costs to protect these trademarks and our other intellectual property. Our trademarks, including Salt Life®, Soffe®, and Junk Food®, among others, are important to our marketing efforts and have substantial value. We aggressively protect these trademarks and have incurred legal costs in the past to establish and protect these trademarks. We may in the future be required to expend significant additional resources to protect these trademarks and our other intellectual property. The loss or limitation of the exclusive right to use our trademarks or other intellectual property could adversely affect our sales and results of operations. A significant portion of our business relies upon license agreements. We rely on licensed products for a significant part of our sales. We believe that our license agreements in the aggregate are of significant value to our business. The loss of or failure to obtain, renew or extend license agreements on favorable terms could adversely affect our sales and have a material adverse effect on our financial condition and results of operations. We may be subject to the impairment of acquired intangible assets. When we acquire a business, a portion of the purchase price of the acquisition may be allocated to goodwill and other identifiable intangible assets. The amount of the purchase price that is allocated to goodwill is determined by the excess of the purchase price over the net identifiable assets acquired. At October 3, 2015, and September 27, 2014, our goodwill and other intangible assets were approximately $58.9 million and $60.2 million, respectively. We conduct an annual review, and more frequent reviews if events or circumstances dictate, to determine whether goodwill is impaired. We also determine whether impairment indicators are present related to our identifiable intangible assets. If we determine that goodwill or intangible assets are impaired, we would be required to write down the value of these assets. We completed our annual impairment test of goodwill on the first day of our 2015 third fiscal quarter. Based on the valuation, we concluded there was no impairment on the goodwill recorded on our financial statements. We also concluded that there are no additional indicators of impairment related to our intangible assets. There can, however, be no assurance that we will not be required to take an impairment charge in the future, which could have a material adverse effect on our results of operations. Changes in the regulations and laws regarding ecommerce could reduce the growth and lower the profitability of our internet sales. The ecommerce industry has undergone, and continues to undergo, rapid development and change. There have been continuing efforts to increase the legal and regulatory obligations of and restrictions on companies conducting commerce through the internet, primarily in the areas of taxation, consumer privacy and protection of consumer personal information. These laws and regulations could increase the costs and liabilities associated with our ecommerce activities, thereby negatively impacting our results of operations. Significant changes to international trade regulations could adversely affect our results of operations. The majority of our products are manufactured in Honduras, El Salvador and Mexico. We therefore benefit from current free trade agreements and other duty preference programs, including the North American Free Trade Agreement (“NAFTA”) and the Central America Free Trade Agreement (“CAFTA”). Our claims for duty free or reduced duty treatment under CAFTA, NAFTA and other available programs are largely conditioned on our ability to produce or obtain accurate records (some of which are provided to us by third parties) about production processes and sources of raw materials. Subsequent repeal or modification of NAFTA or CAFTA, or the inadequacy or unavailability of supporting records, could have a material adverse effect on our results of operations. In addition, our products are subject to foreign competition, which in the past has been faced with significant U.S. government import restrictions. The extent of import protection afforded to domestic apparel producers has been, and is likely to remain, subject to political considerations. The elimination of import protections for domestic apparel producers could significantly increase global competition, which could adversely affect our business and results of operations. 2012 with the U.S. Department of Labor's Office of Trade & Labor Affairs by the AFL-CIO and various Honduran union federations alleging that the Honduran government failed to enforce its labor laws in violation of the provisions of CAFTA. The complaint contains various and sundry allegations of Honduran labor law violations by U.S.-based companies with Honduran operations, including our Ceiba Textiles operations. We contend that the allegations against Ceiba Textiles have no merit. The U.S. Department of Labor has initiated an investigation of the allegations in the complaint. We believe that the legal action, if any, that may result from this investigation would be an action by the U.S. government against Honduras under CAFTA, not a legal action against us related to the specific allegations contained in the complaint. However, an action against Honduras could result in sanctions or other penalties against Honduras under CAFTA or in other governmental action that could have a material negative effect on our ability to conduct business there. Changes in domestic or foreign employment regulations or changes in our relationship with our employees could adversely affect our results of operations. As of October 3, 2015, we employed approximately 7,400 employees worldwide, with approximately 6,100 of these employees being in Honduras, El Salvador or Mexico. Changes in domestic and foreign laws governing our relationships with our employees, including wage and human resources laws and regulations, labor standards, overtime pay, unemployment tax rates, workers' compensation rates and payroll taxes, would likely have a direct impact on our operating costs. A significant increase in wage rates in the countries in which we operate could have a material adverse impact on our operating results. Approximately 1,200 employees at one of our facilities in Honduras are party to a three-year collective bargaining agreement and approximately 1,400 employees at a separate facility in Honduras are party to a three-year collective bargaining agreement. We have historically conducted our operations without significant labor disruptions and believe that our relations with our employees are good. However, if labor relations were to change, it could adversely affect the productivity and ultimate cost of our manufacturing operations. Recent healthcare legislation may increase our costs and reduce our future profitability. To attract and retain employees in our operations in the United States, we maintain a competitive health insurance program for those employees and their dependents. The Patient Protection and Affordable Care Act, signed into law in 2010, has increased our annual employee healthcare cost obligations and is expected to continue to increase our annual employee healthcare cost obligations going forward. We cannot predict the effect that this legislation, or any future state or federal healthcare legislation or regulation, will ultimately have on our business. However, these rising healthcare costs and universal healthcare coverage in the United States could result in significant long-term costs to us, which could adversely affect our future profitability and financial condition. Also, rising healthcare costs could force us to make changes to our benefits program, which could negatively impact our ability to attract and retain employees. We are subject to foreign currency exchange rate fluctuations. We manufacture the majority of our products outside of the United States, exposing us to currency exchange rate fluctuations. In addition, movements in foreign exchange rates can affect transaction costs because we source products from various countries. We may seek to mitigate our exposure to currency exchange rate fluctuations, but our efforts may not be successful. Accordingly, changes in the relative strength of the United States dollar against other currencies could adversely affect our business. The value of our brands, sales of our products and our licensing relationships could be impacted by negative publicity resulting from violations of manufacturing or employee safety standards or labor laws, or unethical business practices, by our suppliers and independent contractors. We are committed to ensuring that all of our manufacturing facilities comply with our strict internal code of conduct, applicable laws and regulations, and the codes and principles to which we subscribe, including those of Worldwide Responsible Accredited Production (WRAP) and the Fair Labor Association (FLA). In addition, we require our suppliers and independent contractors to operate their businesses in compliance with the laws and regulations that apply to them. However, we do not control these suppliers and independent contractors. A violation of our policies, applicable manufacturing or employee safety standards and codes of conduct, labor laws or other laws or regulations by our suppliers or independent contractors could interrupt or otherwise disrupt our operations. Negative publicity regarding the production or operating methods of any of our suppliers or independent contractors or their failure to comply with our policies, applicable manufacturing or employee safety standards and codes of conduct, labor laws or other laws or regulations could adversely affect our reputation, brands, sales and licensing relationships, which could adversely affect our business and results of operations. The market price of our shares is affected by the illiquidity of our shares, which could lead to our shares trading at prices that are significantly lower than expected. Various investment banking firms have informed us that public companies with relatively small market capitalizations have difficulty generating institutional interest, research coverage or trading volume. This illiquidity can translate into price discounts as compared to industry peers or to the shares’ inherent value. We believe that the market perceives us to have a relatively small market capitalization. This could lead to our shares trading at prices that are significantly lower than our estimate of their inherent value. As of November 20, 2015, we had 7,747,579 shares of common stock outstanding. We believe that approximately 76% of our stock is beneficially owned by entities and individuals who each own more than 5% of the outstanding shares of our common stock. Included in the 76% are institutional investors that beneficially own more than 5% of the outstanding shares. These institutional investors own approximately 63% of the outstanding shares of our common stock. Sales of substantial amounts of our common stock in the public market by any of these large holders could adversely affect the market price of our common stock. The market price of our shares may be highly volatile, and the stock market in general can be highly volatile. Fluctuations in our stock price may be influenced by, among other things, general economic and market conditions, conditions or trends in our industry, changes in the market valuations of other apparel companies, announcements by us or our competitors of significant acquisitions, strategic partnerships or other strategic initiatives, and trading volumes. Many of these factors are beyond our control, but may cause the market price of our common stock to decline, regardless of our operating performance. Efforts to comply with the evolving regulatory landscape regarding public company governance and disclosure could result in significant additional costs. We are committed to maintaining high standards for internal controls over financial reporting, corporate governance and public disclosure. However, evolving laws, regulations and standards relating to these issues such as the Dodd-Frank Wall Street Reform and Consumer Protection Act, the Sarbanes-Oxley Act, and similar regulations have created significant additional compliance requirements for companies like us. We have devoted and will continue to devote significant resources, and our management team has devoted and will continue to devote substantial time, to comply with these standards. This may lead to increases in our cost structure, divert the attention of our management team from revenue generating activities to compliance efforts, and could have a material adverse effect on our business, financial condition and results of operations. Our principal executive office is located in a leased facility in Greenville, South Carolina. We own and lease properties supporting our administrative, manufacturing, distribution and direct retail activities. The majority of our products are manufactured through a combination of facilities that we either own, or lease and operate. As of October 3, 2015, we owned or leased ten manufacturing facilities (located in the United States, Honduras, El Salvador and Mexico) and seven distribution facilities (all within the United States). In the March 2014 quarter, we opened a third party-operated distribution facility in Dallas, Texas to better service a large market for undecorated tees with shorter shipping times and reduced freight costs. In addition, we operate three leased factory-direct stores, two flagship retail stores and two leased showrooms. needed. Substantially all of our assets are subject to liens in favor of our lenders under our U.S. asset-based secured credit facility and our Honduran loan. We previously received an inquiry from the U.S. Consumer Product Safety Commission (“Commission”) regarding a children's drawstring hoodie product sourced, distributed and sold by Junkfood, and its compliance with applicable product safety standards. The Commission subsequently investigated the matter, including whether Junkfood complied with the reporting requirements of the Consumer Product Safety Act (“CPSA”), and the garments in question were ultimately recalled. On or about July 25, 2012, Junkfood received notification from the Commission staff alleging that Junkfood knowingly violated CPSA Section 15(b) and that the staff will recommend to the Commission a $900,000 civil penalty. We dispute the Commission's allegations. On August 27, 2012, Junkfood responded to the Commission staff regarding its recommended penalty, setting forth a number of defenses and mitigating factors that could result in a much lower penalty, if any, ultimately imposed by a court should the matter proceed to litigation. While we will continue to defend against these allegations, we believe a risk of loss is probable. Based upon current information, including the terms of previously published Commission settlements and related product recall notices, should the Commission seek enforcement of the recommended civil penalty and ultimately prevail on its claims at trial we believe there is a range of likely outcomes between $25,000 and an amount exceeding $900,000, along with interest and the Commission's costs and fees. During the quarter ended June 30, 2012, we recorded a liability for what we believe to be the most likely outcome within this range, and this liability remains recorded as of October 3, 2015. We were served with a complaint in the Superior Court of the State of California, County of Los Angeles, on or about March 13, 2013, by a former employee of our Delta Activewear business unit at our Santa Fe Springs, California distribution facility alleging violations of California wage and hour laws and unfair business practices with respect to meal and rest periods, compensation and wage statements, and related claims (the "Complaint"). The Complaint is brought as a class action and seeks to include all of our Delta Activewear business unit's current and certain former employees within California who are or were non-exempt under applicable wage and hour laws. The Complaint also names as defendants Junkfood, Soffe, an independent contractor of Soffe, and a former employee, and sought to include all current and certain former employees of Junkfood, Soffe and the Soffe independent contractor within California who are or were non-exempt under applicable wage and hour laws. Delta Apparel, Inc. is now the only remaining defendant in this case. The Complaint seeks injunctive and declaratory relief, monetary damages and compensation, penalties, attorneys' fees and costs, and pre-judgment interest. On or about August 22, 2014, we were served with an additional complaint in the Superior Court of the State of California, County of Los Angeles, by a former employee of Junkfood and two former employees of Soffe at our Santa Fe Springs, California distribution facility alleging violations of California wage and hour laws and unfair business practices the same or substantially similar to those alleged in the Complaint and seeking the same or substantially similar relief as sought in the Complaint. This complaint is brought as a class action and seeks to include all current and certain former employees of Junkfood, Soffe, our Delta Activewear business unit, the Soffe independent contractor named in the Complaint and an individual employee of such contractor within California who are or were non-exempt under applicable wage and hour laws. Delta Apparel, Inc. and the contractor employee have since been voluntarily dismissed from the case and the remaining defendants are Junkfood, Soffe, and the Soffe contractor. On September 17, 2015, an agreement in principle was reached between all parties to settle the above-referenced wage and hour matters. Pursuant to that agreement, the defendants in the matters have agreed to pay an aggregate amount of $300,000 in exchange for a comprehensive release of all claims at issue in the matters. Delta Apparel, Inc., Soffe and Junkfood have collectively agreed to contribute $200,000 towards the aggregate settlement amount, which is in our accrued expenses as of October 3, 2015. The settlement agreement requires the approval of the applicable courts before it can be finalized and the parties are currently seeking the necessary approvals. Market Information for Common Stock: The common stock of Delta Apparel, Inc. is listed and traded on the NYSE MKT under the symbol “DLA”. As of November 30, 2015, there were approximately 889 record holders of our common stock. The following table sets forth, for each of the periods indicated below, the high and low sales prices per share of our common stock as reported on the NYSE MKT. Dividends: Our Board of Directors did not declare, nor were any dividends paid, during fiscal years 2015 and 2014. Subject to the provisions of any outstanding blank check preferred stock (none of which is currently outstanding), the holders of our common stock are entitled to receive whatever dividends, if any, that may be declared from time to time by our Board of Directors in its discretion from funds legally available for that purpose. Pursuant to the terms of our credit facility, we are allowed to make cash dividends and stock repurchases if (i) as of the date of the payment or repurchase and after giving effect to the payment or repurchase, we have availability on that date of not less than $18.125 million and average availability for the 30-day period immediately preceding that date of not less than $18.125 million; and (ii) the aggregate amount of dividends and stock repurchases after May 27, 2011, does not exceed $19 million plus 50% of our cumulative net income (as defined in the Amended Loan Agreement) from the first day of fiscal year 2012 to the date of determination. At October 3, 2015, and September 27, 2014, there was $7.3 million and $8.2 million, respectively, of retained earnings free of restrictions to make cash dividends or stock repurchases. Any future cash dividend payments will depend upon our earnings, financial condition, capital requirements, compliance with loan covenants and other relevant factors. Purchases of our Own Shares of Common Stock: See Note 14 - Repurchase of Common Stock and Note 8 - Debt, in Item 15, which is incorporated herein by reference. Securities Authorized for Issuance Under Equity Compensation Plans: The information required by Item 201(d) of Regulation S-K is set forth under “Item 12. Security Ownership of Certain Beneficial Owners and Management and Related Stockholder Matters” of this Annual Report, which information is incorporated herein by reference. 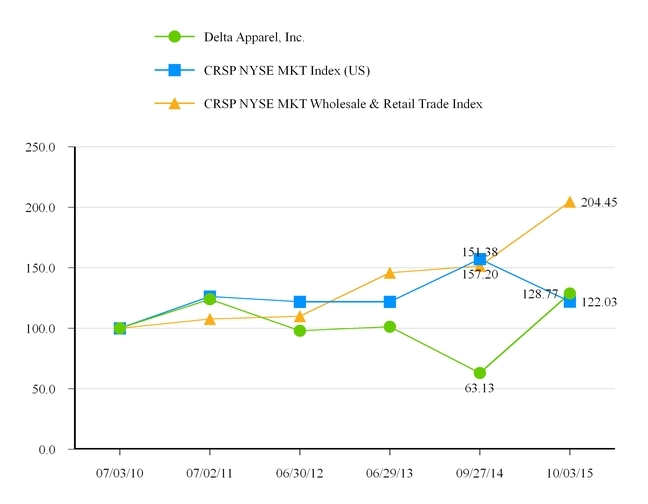 Comparison of Total Return Among Delta Apparel, Inc., CRSP NYSE MKT Index (US), and CRSP NYSE MKT Wholesale & Retail Trade Index: Our common stock began trading on the NYSE MKT (previously the NYSE Amex) on June 30, 2000, the last trading day of our fiscal year 2000. Prior to that date, no securities of Delta Apparel were publicly traded. Set forth below is a line graph comparing the yearly change in the cumulative total stockholder return, assuming dividend reinvestment, of our common stock with (1) the CRSP NYSE MKT Index (US) and (2) the CRSP NYSE MKT Wholesale and Retail Trade Index, which is comprised of all NYSE MKT companies with SIC codes from 5000 through 5999. This performance graph assumes that $100 was invested in the common stock of Delta Apparel and comparison groups on July 3, 2010, and that all dividends have been reinvested. See information regarding our acquisitions within “Item 1. Business” under the heading “Acquisitions”. The selected financial data includes the financial position and results of operations of acquired businesses beginning on the date of acquisition. The consolidated statements of operations data for the years ended July 2, 2011, and June 30, 2012, and the consolidated balance sheet data as of July 2, 2011, June 30, 2012, June 29, 2013, and September 28, 2013, are derived from, and are qualified by reference to, our audited consolidated financial statements not included in this document. The consolidated statement of operations data for the years ended June 29, 2013, September 27, 2014, and October 3, 2015, and the consolidated balance sheet data as of September 27, 2014, and October 3, 2015, as well as the consolidated statement of operations data for the transition period ended September 28, 2013, are derived from, and are qualified by reference to, our audited consolidated financial statements included elsewhere in this document. We operate on a 52-53 week fiscal year ending on the Saturday closest to September 30. All fiscal years shown were 52-week years with the exception of fiscal year 2015, which was a 53-week year, and the 13-week transition period ended September 28, 2013. Historical results are not necessarily indicative of results to be expected in the future. The selected financial data should be read in conjunction with the Consolidated Financial Statements and the related notes as indexed on page F-1 and “Management’s Discussion and Analysis of Financial Condition and Results of Operations” in Item 7. In 2015, we began to see the benefits from the operational accomplishments completed during the year and the strategic initiatives we implemented in the fourth quarter of fiscal 2014. These initiatives have proved successful in regard to cost savings, efficiency gains, profit growth, and better service to our customers. During the year, we invested in areas of our business where we expect to yield strong returns in the future. We began the expansion of our Honduran textile facility, Ceiba Textiles, with all of the new equipment having been ordered and some having been received and installed. We expect this equipment to be operational in the first calendar quarter of 2016, and we should start seeing the benefits shortly thereafter. This expansion will extend our production capabilities into open-width fabric, reducing our reliance on purchased fabric. This should allow us to better serve our customers as well as expand our product offerings. We continue to maintain a sharp focus on lowering our product cost and improving our supply chain, while staying aligned with the needs of our customers. Our ecommerce business continues to grow and we believe investments in this area of our business should drive top line growth. We have added several new functions to complement our ecommerce sites. We also invested in Art Gun, our digital print business. Art Gun's facility boasts cutting-edge equipment and industry-leading proprietary software geared to facilitate ecommerce business. Art Gun now has new equipment in place and is prepared for continued strong growth in fiscal 2016. Sales in our Delta Activewear business increased approximately 6% over the prior year. This was driven by an increase in our private label products, where our service levels attracted new customers, and drove expanded business with existing customers. During the year, we also had success in new product categories such as fleece and our Delta-Dri performance products. Soffe implemented a new marketing campaign, "The Strength is in Us", during fiscal year 2015. Sales in the back half of the year were comparable to the prior year. The Soffe core short is trending well with consumers, and a number of major retailers are expanding doors with the short. Soffe has a large consumer fan group and its direct-to-consumer sales continued to increase, with 25% sales growth compared to the prior year. Junkfood also continued its strong growth in direct-to-consumer sales on its branded website, with sales up 53% during fiscal year 2015. Our new Junkfood store on the iconic Abbot Kinney Boulevard in Venice, California has attracted numerous national retailers and licensors who are able to witness the most effective ways to merchandise Junkfood products. Salt Life sales, while hindered during the year by a necessary move of its distribution center, grew 10% in the September quarter. Gross margins remain strong and expanded 440 basis points from last year. Demand for Salt Life products remains strong and we anticipate a return to historical sales growth in fiscal 2016. We have a number of new Salt Life marketing programs driving brand awareness such as social media, the Salt Life You Tube channel, team ambassadors and the famous Salt Life stickers. We completed a number of specific initiatives over the past fiscal year to improve Delta Apparel. We expect these steps to provide growth and improved profitability in the upcoming year. Net sales for the fiscal year ended October 3, 2015, were $449.1 million, up 2.5% from the prior twelve months when adjusted for the second quarter sale of The Game business. Gross margins increased 80 basis points in fiscal year 2015, with gross margin improvements in all business units with the exception of Soffe. Our overall SG&A cost decreased $5.2 million to 18.1% of sales from 19% of sales in the prior year. The gain on sale of business in fiscal year 2015 includes $14.9 million in proceeds from the sale of The Game business less the assets sold and direct liabilities resulting from, and selling costs associated with, that transaction. See Note 3 - Sale of The Game, for further information on this transaction. At October 3, 2015, we had $3.1 million accrued in contingent consideration related to the Salt Life Acquisition, a $0.5 million reduction from the accrual at September 27, 2014. The reduction resulted from our current sales levels being lower than we originally anticipated and the reduced remaining time of the measurement period. Net income, inclusive of the gain on the sale of The Game, for fiscal year 2015 was $8.1 million, or $1.00 per diluted share, compared with a net loss in the prior year of $1.0 million, or $0.12 per diluted share. sales were up approximately 2% versus the prior year, driven from double-digit sales growth in boutiques and specialty retailers, partially offset by weaker sales through department stores. The Salt Life and Junkfood sales growth was offset by sales declines in our other branded business units. Operating income for the segment increased year-over-year to $6.4 million. This increase was primarily due to the sale of The Game business generating a $5.6 million pre-tax gain, including associated indirect expenses. Additionally, gross margin expansion, coupled with a decline in general and administrative expenses, has improved operating results. Net sales in our basics segment were $282.5 million in fiscal year 2015, a 6.2% increase from $265.9 million in the prior year period due to increases in the private label programs in Delta Activewear along with new customers across our basics segment. Gross margins as a percent of sales increased by 110 basis points to 11.7% of sales, compared to 10.6% of sales for the prior fiscal year due to lower product costs. Operating income increased by $6.3 million, to 3.4% of sales, compared to $3.4 million, or 1.3% of sales, for the same period last year due to higher margins along with decreased fixed compensation. For information regarding quarterly financial data, refer to Note 17 - Quarterly Financial Information (Unaudited) to the Consolidated Financial Statements, which information is incorporated herein by reference. Net sales for fiscal year 2015 grew 2.5% compared with the prior year after adjusting for the sale of The Game business in March 2015. Our direct-to-consumer and ecommerce sales represented 4.4% of total revenues for the 2015 fiscal year, a 150 basis point increase over the prior year period, during which direct-to-consumer and ecommerce sales were 2.9% of total revenues. Gross margins increased in fiscal 2015 by 80 basis points from fiscal 2014, to 19.7% of sales compared to 18.9% in fiscal 2014. Increases occurred in both the branded and basics segments, and across all operating units with the exception of Soffe. Gross margins improved due to customer and product mix along with improved manufacturing efficiencies and lower costs. Our gross margins may not be comparable to other companies because some companies include costs related to their distribution network in cost of goods sold and we exclude them from gross profit and include them in selling, general and administrative expenses. Fiscal year 2015 selling, general and administrative expenses were $81.1 million, or 18.1% of sales, compared to $86.3 million, or 19.0% of sales, in fiscal year 2014. The decrease in selling, general and administrative expenses is primarily due to lower fixed compensation and benefit costs, along with a decrease in variable selling costs and lower legal costs. Fiscal 2014 included $2.2 million of severance related expenses associated with our strategic initiatives during the fourth quarter of fiscal year 2014. The change in fair value of contingent consideration is the remeasurement of the fair value the contingent consideration related to the Salt Life Acquisition. Based upon the current operating results and future projections, a $0.5 million reduction in contingent consideration was recorded. Our gain on sale of business was $7.7 million for fiscal year 2015. The gain on sale of business in fiscal year 2015 includes the $14.9 million in proceeds from the sale of The Game business less the assets sold, the direct liabilities resulting from, and the selling costs associated with, this transaction. Associated with the disposition of The Game, $2.1 million of indirect expenses were also recorded, resulting in a net gain, including indirect expenses, of $5.6 million. See Note 3 - Sale of The Game, for more information on this transaction. Other income increased to $0.7 million in fiscal year 2015 from $0.9 million of expense in fiscal year 2014. This increase was due to an increase in income from our Honduran joint venture of $0.3 million, as well as a $0.1 million increase in sublease income. Fiscal year 2015 operating income was $16.1 million, or 3.6% of sales, compared to an operating loss of $1.7 million, or 0.4% of sales, in fiscal year 2014. Operating income was $9.7 million in the basics segment and $6.4 million in the branded segment. Interest expense for fiscal year 2015 was $6.0 million compared to $5.8 million in fiscal year 2014. The increase is due primarily to the higher interest rate on the U.S. credit facility compared to the imputed interest on the Salt Life promissory note related to the $9.0 million Salt Life payment made at the beginning of the fiscal year, along with higher debt levels in the first half of the fiscal year. Our fiscal year 2015 effective income tax rate was 19.9% compared to an effective tax rate of 87.1% in the prior fiscal year. The prior year rate was driven from a small overall loss encompassing foreign profits in non-tax jurisdictions and losses in the United States. We benefit from having income in foreign jurisdictions that are either exempt from income taxes or have tax rates lower than the United States. Net income for fiscal year 2015 was $8.1 million, or $1.00 per diluted share, compared with a net loss in the prior fiscal year of $1.0 million or $0.12 per diluted share. Net sales for fiscal year 2014 were $452.9 million, a $37.6 million decline from fiscal year 2013 sales of $490.5 million and a $30.1 million, or 6.2%, decrease from the prior twelve-month period's sales of $483.0 million. Our direct-to-consumer and ecommerce sales represented 2.9% of total revenues, a 120 basis point and 80 basis point increase over fiscal year 2013 and the prior year period, during which direct-to-consumer and ecommerce sales were 1.7% and 2.1% of total revenues, respectively. Gross margins decreased 340 and 280 basis points to 18.9% of net sales in fiscal year 2014 from 22.3 % and 21.7% of net sales from fiscal year 2013 and the prior twelve-month period, respectively. This decline was driven from a tougher retail environment with pressures on pricing as well as higher input costs. Additionally, there was $0.9 million in strategic initiative-related expenses impacting gross margins. Our gross margins may not be comparable to other companies because some companies include costs related to their distribution network in cost of goods sold and we exclude them from gross profit and include them in selling, general and administrative expenses. Fiscal year 2014 selling, general and administrative expenses were $86.3 million, or 19.0% of sales, compared to $90.0 million and $95.7 million, or 18.3% and 19.8% of sales, in fiscal year 2013 and the prior twelve-month prior period, respectively. The decrease in selling, general and administrative expenses is primarily due to a decrease in variable selling costs and a decline in performance-based compensation expense resulting from decreased earnings in fiscal year 2014 compared to the prior fiscal year and the prior twelve-month period. We recorded $2.2 million of severance-related expenses associated with our strategic initiatives during the fourth quarter of fiscal year 2014. In addition, fiscal year 2013 included $1.2 million of costs associated with a previously disclosed internal investigation conducted by our Audit Committee related to fiscal year 2012. Other expense increased to $1.1 million in fiscal year 2014 from $0.7 million and $0.4 million in fiscal year 2013 and the prior twelve months, respectively. This increase was due to impairment charges related to our strategic initiatives and change in contingent consideration. Fiscal year 2014 operating loss, adjusted for the $4.0 million in costs related to the strategic initiatives, was $2.4 million of operating income, or 0.5% of sales, compared to $13.9 million and $8.6 million operating income, or 2.8% and 1.8% of sales, in fiscal year 2013 and the prior twelve-month period, respectively. Without this adjustment, fiscal year 2014 operating loss was $1.7 million, or 0.4% of sales, compared to $8.6 million in operating income, or 1.8% of sales, in the prior year period. Operating income of $3.4 million in the basics segment was offset by a $5.1 million loss in the branded segment. The decline in operating income was driven by lower sales in the Junkfood and Soffe businesses offset by higher Salt Life sales. Interest expense for fiscal year 2014 was $5.8 million, an increase of $1.8 million from fiscal year 2013 and the prior year twelve-month period. The increase is due primarily to the increased debt related to the Salt Life Acquisition and the Honduran manufacturing expansion. Our fiscal year 2014 effective income tax rate was 87.1% compared to an effective tax rate of 7.3% and 32.5% in the prior fiscal year and the prior twelve months, respectively. We benefit from having income in foreign jurisdictions that are either exempt from income taxes or have tax rates lower than the United States. Net income for fiscal year 2014, adjusted for the $4.0 million pre-tax impact of strategic initiatives, was $1.5 million, or $0.19 per diluted share, compared with net income in the prior fiscal year and prior twelve-month period of $9.2 million and $6.2 million, or $1.12 and $0.74 per diluted share, respectively. Without adjustment for the impact of our strategic initiatives, our net loss for the year was $1.0 million, or $0.12 per diluted share. The foregoing discussion of our results of operations includes references to certain non-GAAP financial measures, including adjusted net income and adjusted diluted EPS. Below is a reconciliation of each non-GAAP financial measure for the periods presented in the foregoing discussion to the most directly comparable GAAP financial measure. Non-GAAP financial measures should not be considered in isolation or as a substitute for comparable GAAP financial measures. The non-GAAP financial measures we have presented have limitations in that they do not reflect all of the amounts associated with the results of operations as determined in accordance with GAAP, and these non-GAAP financial measures should only be used to evaluate the results of operations in conjunction with the corresponding GAAP financial measures. We believe that the non-GAAP financial measures presented provide meaningful supplemental information regarding the operating results primarily because they exclude certain non-cash charges or items that we do not believe are reflective of ongoing operating results. We believe that these non-GAAP financial measures also facilitate the comparison by management and investors of results between periods and among peer companies. However, those companies may calculate similar non-GAAP financial measures differently, limiting their usefulness as comparative measures. Net sales for the three-month transition period ended September 28, 2013, were $122.6 million, a decrease of 6% compared to the prior year quarter net sales of $130.1 million. Net earnings were $568 thousand, or $0.07 per diluted share, compared with $3.6 million or $0.41 per diluted share, in the prior year quarter. Sales within the branded segment were $60.2 million, down 5.2% compared with $63.5 million for the prior year's first quarter. The primary reason for the decrease was a 28% decline in Soffe sales, which was somewhat offset by strong revenue growth in other brands. Junkfood, Art Gun, and Salt Life all had double digit sales growth, with Art Gun sales more than doubling. Salt Life revenue growth exceeded our expectations, with sales up 44% over the prior year September quarter. Net sales in our basics segment were down 6.4% to $62.3 million, compared with $66.6 million in the prior year period. Sales of undecorated tees started out strong in July 2013, but weakened in August and September as retail traffic and an earlier than expected build-up of inventories in the retail sector resulted in price discounting to drive volumes and lower than expected sales of undecorated tees as the period progressed. Our private label sales also slowed as our customers shifted their callouts to balance inventory from the lower sales at retail. SG&A expenses were $26.6 million, or 21.7% of sales, for the transition period, compared to $25.9 million, or 19.9% of sales, for the prior year September quarter. This increase in SG&A was primarily due to expenses associated with the Salt Life Acquisition, higher than normal bad debt expense and the recording of a contingent liability associated with legal matters in California. Our effective income tax rate for the three months ended September 28, 2013, was 219.1%, compared to an effective tax benefit of 25.1% for the prior year September quarter. We have a three-month tax year associated with the transition period. We benefit from having income in foreign jurisdictions that are either exempt from income taxes or have tax rates lower than the United States. The transition period benefited as overall operating profits were lower than normal, which lowered our U.S. taxable income while maintaining profits in the offshore taxable and tax-free jurisdictions. Delta Apparel, Soffe, Junkfood, Salt Life (f/k/a To The Game, LLC) and Art Gun are borrowers under the May 27, 2011, Fourth Amended and Restated Loan and Security Agreement with the financial institutions named therein as Lenders, Wells Fargo Bank, National Association, as Administrative Agent, Bank of America, N.A., as Syndication Agent, Wells Fargo Capital Finance, LLC, as Sole Lead Arranger, and Wells Fargo Capital Finance, LLC and Merrill Lynch, Pierce, Fenner & Smith Incorporated, as Joint Bookrunners. Pursuant to the Amended Loan Agreement, the line of credit under our U.S. revolving credit facility is $145 million (subject to borrowing base limitations), and matures on May 27, 2017. Provided that no event of default exists, we have the option to increase the maximum credit available under the facility to $200 million (subject to borrowing base limitations), conditioned upon the Administrative Agent's ability to secure additional commitments and customary closing conditions. At October 3, 2015, we had $79.6 million outstanding under our U.S. revolving credit facility at an average interest rate of 2.7%, and had the ability to borrow an additional $31.9 million. For further information regarding our U.S. asset-based secured credit facility, refer to Note 9 - Long-Term Debt to the Consolidated Financial Statements, which information is incorporated herein by reference. In conjunction with the Salt Life Acquisition, we issued two promissory notes in the aggregate principal amount of $22.0 million, which included a one-time installment of $9.0 million that was due and paid as required on September 30, 2014, and quarterly installments commencing on March 31, 2015, with the final installment due on June 30, 2019. The promissory notes are zero-interest notes and state that interest will be imputed as required under Section 1274 of the Internal Revenue Code. We have imputed interest at 1.92% and 3.62% on the promissory notes that mature on June 30, 2016, and June 30, 2019, respectively. At October 3, 2015, the discounted value of the promissory notes was $10.8 million. Refer to Note 9 - Long Term Debt to the Consolidated Financial Statements for further information on these promissory notes. We have loan agreements with Banco Ficohsa, a Honduran bank. This credit facility is secured by a first-priority lien on the assets of our Honduran operations and the loans are not guaranteed by our U.S. entities. As of October 3, 2015, we had a total of $11.9 million outstanding on these loans. For further information regarding our Honduran loans, refer to Note 9 - Long-Term Debt to the Consolidated Financial Statements, which information is incorporated herein by reference. Our primary cash needs are for working capital and capital expenditures, as well as to fund share repurchases under our Stock Repurchase Program. In addition, in the future we may use cash to pay dividends. From time to time we may use derivative instruments to manage our exposure to interest rates. These financial instruments are not used for trading or speculation purposes. When we enter into a derivative instrument, we determine whether hedge accounting can be applied. Where hedge accounting can be applied, a hedge relationship is designated as either a fair value hedge or cash flow hedge. The hedge is documented at inception, detailing the particular risk objective and strategy considered for undertaking the hedge. The documentation identifies the specific asset or liability being hedged, the risk being hedged, the type of derivative used and how effectiveness of the hedge will be assessed. During fiscal years 2015, 2014, 2013 and the transition period ended September 28, 2013, the interest rate swap agreements had minimal ineffectiveness and were considered highly-effective hedges. Changes in the derivatives’ fair values are deferred and are recorded as a component of accumulated other comprehensive income (“AOCI”), net of income taxes, until the underlying transaction is recorded. When the hedged item affects income, gains or losses are reclassified from AOCI to the Consolidated Statements of Operations as interest income/expense. Any ineffectiveness in our hedging relationships is recognized immediately in the Consolidated Statement of Operations. The changes in fair value of the interest rate swap agreements resulted in an AOCI loss, net of taxes, of $0.2 million for the year ended October 3, 2015, an AOCI gain, net of taxes of $0.3 million for the year ended September 27, 2014, an AOCI loss, net of taxes, of $0.5 million for the transition period ended September 28, 2013, and an AOCI gain, net of taxes, of $47 thousand for the year ended June 29, 2013. Cash provided by operating activities in fiscal year 2015 was $22.3 million compared to $14.0 million for fiscal year 2014. The increase from the prior year is primarily related to increased earnings in the business. The increased earnings, along with a reduction in our accounts receivable and inventory, was partially offset by increased payments to our suppliers during the year. Cash provided in investing activities in fiscal year 2015 was $7.6 million compared to $8.8 million used in investing activities in fiscal year 2014. Capital expenditures during fiscal year 2015 were $7.8 million and included expenditures for the expansion of our textile operations that should decrease purchased fabric and reduce costs by leveraging internal operations. During fiscal year 2015, investing cash flows also included the $14.9 million in proceeds received from the sale of The Game assets. See Note 3 - Sale of The Game, for further information on this transaction. In fiscal year 2014, we used $8.9 million in cash primarily related to the expansion of our textile operations, along with investments in our information technology systems. We expect to spend approximately $10 million in capital expenditures in fiscal year 2016, primarily on manufacturing equipment, along with information technology, and direct-to-consumer investments. Cash used by financing activities was $30.2 million in fiscal year 2015 compared to $5.4 million in fiscal year 2014. In fiscal year 2015, cash was used primarily to lower our debt levels and repurchase shares of our common stock. to issue letters of credit to suppliers, or may cause the borrowing availability under our facility to be insufficient for our needs. Availability under our credit facility is primarily a function of the levels of our accounts receivable and inventory, as well as the uses of cash in our operations. A significant deterioration in our accounts receivable or inventory levels could restrict our ability to borrow additional funds or service our indebtedness. Moreover, our credit facility includes a financial covenant that if the availability under our credit facility falls below the amounts specified in our credit agreement, our Fixed Charge Coverage Ratio (“FCCR”) (as defined in our credit agreement) for the preceding 12-month period must not be less than 1.1 to 1.0. Although our availability at October 3, 2105, was above the minimum thresholds specified in our credit agreement, a significant deterioration in our business could cause our availability to fall below such thresholds, thereby requiring us to maintain the minimum FCCR specified in our credit agreement. As of October 3, 2015, our FCCR was above the minimum threshold specified in our credit agreement. The following table summarizes our contractual cash obligations, as of October 3, 2015, by future period. We include interest on our fixed rate debt as a component of our future obligations. However, we exclude interest payments on our debt since the majority is under a revolving credit facility and the cash outlay for the interest is unknown and cannot be reliably estimated. Interest payments will be determined based upon the daily outstanding balance of the revolving credit facility and the prevailing interest rate during that time. We excluded deferred income tax liabilities of $9.1 million from the contractual cash obligations table because we believe inclusion would not be meaningful. Refer to Note 9 - Income Taxes to our Consolidated Financial Statements for more information on our deferred income tax liabilities. Deferred income tax liabilities are calculated based on temporary differences between tax bases of assets and liabilities and their respective book bases, which will result in taxable amounts in future years when the liabilities are settled at their reported financial statement amounts. The results of these calculations do not have a direct connection with the amount of cash taxes to be paid in any future periods and therefore would not relate to liquidity needs. As a result, including deferred income tax liabilities as payments due by period in the schedule could be misleading. As of October 3, 2015, we did not have any off-balance sheet arrangements that were material to our financial condition, results of operations or cash flows as defined by Item 303(a)(4) of Regulation S-K promulgated by the SEC other than the letters of credit, operating leases, and purchase obligations described in the table above. We have entered into derivative interest rate contracts as described and included below in “Quantitative and Qualitative Disclosures about Market Risk” in Item 7A of this report. Pursuant to the terms of our credit facility, we are allowed to make cash dividends and stock repurchases if (i) as of the date of the payment or repurchase and after giving effect to the payment or repurchase, we have availability on that date of not less than $18.125 million and average availability for the 30-day period immediately preceding that date of not less than $18.125 million; and (ii) the aggregate amount of dividends and stock repurchases after May 27, 2011, does not exceed $19 million plus 50% of our cumulative net income (as defined in the Amended Loan Agreement) from the first day of fiscal year 2012 to the date of determination. At October 3, 2015, and September 27, 2014, there was $7.3 million and $8.2 million, respectively, of retained earnings free of restrictions to make cash dividends or stock repurchases. Our Board of Directors did not declare, nor were any dividends paid, during fiscal years 2015 and 2014. Any future cash dividend payments will depend upon our earnings, financial condition, capital requirements, compliance with loan covenants and other relevant factors. 3, 2015, we have purchased 2,262,582 shares of common stock for an aggregate of $27.4 million since the inception of the Stock Repurchase Program. All purchases were made at the discretion of management and pursuant to the safe harbor provisions of SEC Rule 10b-18. As of October 3, 2015, $2.6 million remained available for future purchases under our Stock Repurchase Program, which does not have an expiration date. The discussion and analysis of our financial condition and results of operations are based upon our Consolidated Financial Statements, which were prepared in accordance with U.S. generally accepted accounting principles (“GAAP”). The preparation of our Consolidated Financial Statements requires us to make estimates and judgments that affect the reported amounts of assets and liabilities and disclosure of contingent liabilities at the date of the financial statements and the reported amounts of revenues and expenses during the reporting periods. We base our estimates and judgments on historical experience and various other factors that we believe to be reasonable under the circumstances, the results of which form the basis for making judgments about the carrying values of assets and liabilities that are not readily apparent from other sources. Actual results may differ from these estimates under different assumptions or conditions. Our most critical accounting estimates, discussed below, pertain to revenue recognition, accounts receivable and related reserves, inventory and related reserves, the carrying value of goodwill, and the accounting for income taxes. Note 2 to our Consolidated Financial Statements includes a summary of the significant accounting policies or methods used in the preparation of our Consolidated Financial Statements. Revenues from product sales are recognized when ownership is transferred to the customer, which includes not only the passage of title, but also the transfer of the risk of loss related to the product. At this point, the sales price is fixed and determinable, and we are reasonably assured of the collectibility of the sale. The majority of our sales are shipped FOB shipping point and revenue is therefore recognized when the goods are shipped to the customer. For sales that are shipped FOB destination point, we do not recognize the revenue until the goods are received by the customer. Shipping and handling charges billed to our customers are included in net revenue and the related costs are included in cost of goods sold. Revenues are reported on net sales basis, which is computed by deducting product returns, discounts and estimated returns and allowances. We estimate returns and allowances on an ongoing basis by considering historical and current trends. In the normal course of business, we extend credit to our customers based upon defined credit criteria. Accounts receivable, as shown on our Consolidated Balance Sheets, are net of related reserves. We estimate the net collectibility of our accounts receivable and establish an allowance for doubtful accounts based upon this assessment. In situations where we are aware of a specific customer’s inability to meet its financial obligation, such as in the case of a bankruptcy filing, a specific reserve for bad debts is recorded against amounts due to reduce the net recognized receivable to the amount reasonably expected to be collected. For all other customers, reserves are determined through analysis of the aging of accounts receivable balances, historical bad debts, customer concentrations, customer credit-worthiness, current economic trends and changes in customer payment terms. In addition, reserves are established for other concessions that have been extended to customers, including advertising, markdowns and other accommodations, net of historical recoveries. These reserves are determined based upon historical deduction trends and evaluation of current market conditions. Significant changes in customer concentration or payment terms, deterioration of customer credit-worthiness or further weakening in economic trends could have a significant impact on the collectibility of receivables and our operating results. We state inventories at the lower of cost or market using the first-in, first-out method. Inventory cost includes materials, labor and manufacturing overhead on manufactured inventory, and all direct and associated costs, including inbound freight, to acquire sourced products. See Note 2(y) for further information regarding yarn procurements. We regularly review inventory quantities on hand and record reserves for obsolescence, excess quantities, irregulars and slow moving inventory based on historical selling prices, current market conditions, and forecasted product demand to reduce inventory to its net realizable value. If actual selling prices are less favorable than those projected, or if sell-through of the inventory is more difficult than anticipated, additional inventory reserves may be required. selling, general and administrative expenses, capital expenditures, cash flows and the selection of an appropriate discount rate, all of which are subject to inherent uncertainties and subjectivity. When we perform goodwill impairment testing, our assumptions are based on annual business plans and other forecasted results, which we believe represent those of a market participant. We select a discount rate, which is used to reflect market-based estimates of the risks associated with the projected cash flows, based on the best information available as of the date of the impairment assessment. Given the current macro-economic environment and the uncertainties regarding its potential impact on our business, there can be no assurance that our estimates and assumptions used in our impairment tests will prove to be accurate predictions of the future. If our assumptions regarding forecasted cash flows are not achieved, it is possible that an impairment review may be triggered and goodwill may be determined to be impaired. We account for income taxes under the liability method. Deferred tax assets and liabilities are recognized for the future tax consequences attributable to differences between the financial statement carrying amounts of existing assets and liabilities and their respective tax bases, and operating loss and tax credit carryforwards. Deferred tax assets and liabilities are measured using enacted tax rates expected to apply to taxable income in the years in which those temporary differences are expected to be recovered or settled. As of October 3, 2015, we have a federal net operating loss carryforward of $23.1 million, which is classified in deferred tax assets, as there is no carryback opportunity and the entire loss must be carried forward for utilization against future taxable income. We determined that no valuation allowance is required to be recorded against the federal net operating loss carryforward under Financial Accounting Standards Board ("FASB") Codification No. 740, Income Taxes ("ASC 740"). These federal net loss carryforwards expire at various intervals from 2033 to 2035. We established a valuation allowance related to certain of our state operating loss carryforward amounts in accordance with the provisions of ASC 740. We continually review the adequacy of the valuation allowance and recognize the benefits of deferred tax assets if reassessment indicates that it is more likely than not that the deferred tax assets will be realized based on earnings forecasts in the respective state tax jurisdictions. We had state net operating loss carryforwards (“NOLs”) as of October 3, 2015, of approximately $58.5 million. We had deferred tax assets of $2.4 million as of October 3, 2015, related to these state NOLs, with related valuation allowances against them of approximately $0.2 million. These state net loss carryforwards expire at various intervals from 2019 through 2035. A valuation allowance is required if there is any evidence that some or all of a deferred tax asset will not be realized. In making this final determination, the Company follows ASC 740 and looks to taxable income in prior carryback years, reversals of existing temporary book/tax differences, tax planning strategies and future taxable income exclusive of reversals of existing temporary differences. By its very nature, future taxable income requires estimates and judgments about future events that may be predictable, but are far less certain than past events that can be objectively measured. Based on current analysis and assessments, the Company concluded that no valuation allowance is required on existing deferred tax assets resulting from temporary deductible differences or on federal net operating losses as these are both expected to be fully utilized with future earnings or tax planning strategies. However, based upon the analysis of the sources of taxable income, we did determine a valuation allowance was required on the deferred tax asset resulting from certain state net operating loss carryforwards. The amount of the valuation allowance booked was calculated after considering all four sources mentioned above. For information regarding recently issued accounting standards, refer to Note 2(aa) and Note 2(bb) to our Consolidated Financial Statements. We have a supply agreement with Parkdale to supply our yarn requirements until December 31, 2018. Under the supply agreement, we purchase from Parkdale all of our yarn requirements for use in our manufacturing operations, excluding yarns that Parkdale does not manufacture or cannot manufacture due to temporary capacity constraints. The purchase price of yarn is based upon the cost of cotton plus a fixed conversion cost. Thus, we are subject to the commodity risk of cotton prices and cotton price movements, which could result in unfavorable yarn pricing for us. We fix the cotton prices as a component of the purchase price of yarn, pursuant to the supply agreement, in advance of the shipment of finished yarn from Parkdale. Prices are set according to prevailing prices, as reported by the New York Cotton Exchange, at the time we elect to fix specific cotton prices. Yarn with respect to which we have fixed cotton prices at October 3, 2015, was valued at $39.5 million, and is scheduled for delivery between October 2015 and October 2016. At October 3, 2015, a 10% decline in the market price of the cotton covered by our fixed price yarn would have had a negative impact of approximately $2.9 million on the value of the yarn. This compares to what would have been a negative impact of $1.1 million at our 2014 fiscal year end based on the yarn with fixed cotton prices at September 27, 2014.
in cost of sales in the Consolidated Statements of Operations. We did not own any significant cotton options contracts on October 3, 2015, or September 27, 2014. Our U.S. revolving credit facility provides that the outstanding amounts owed shall bear interest at variable rates. If the amount of outstanding floating rate indebtedness at October 3, 2015, under the U.S. revolving credit facility had been outstanding during the entire year and the interest rate on this outstanding indebtedness was increased by 100 basis points, our expense would have increased by approximately $0.2 million, or 3.2%, for the fiscal year. This compares to an increase of $0.4 million, or 6.3%, for the 2014 fiscal year based on the outstanding floating rate indebtedness at September 27, 2014. The effect of a 100 basis point increase in interest rates would have had a lower dollar impact for the year ended October 3, 2015, compared to the year ended September 27, 2014, from the lower floating rate debt outstanding on October 3, 2015. The percentage increase is less significant for fiscal year 2015 than for fiscal year 2014 because our total interest expense for fiscal year 2015 was higher than our total interest expense for fiscal year 2014. The actual increase in interest expense resulting from a change in interest rates would depend on the magnitude of the increase in rates and the average principal balance outstanding. From time to time, we may use interest rate swaps or other instruments to manage our interest rate exposure and reduce the impact of future interest rate changes. See Note 2(z) and Note 15(d) to the Consolidated Financial Statements for more information on our derivatives. Our Consolidated Financial Statements for each of our fiscal years ended October 3, 2015, September 27, 2014, and June 29, 2013, and the transition period ended September 28, 2013, together with the Reports of Independent Registered Public Accounting Firms thereon, are included in this report commencing on page F-1 and are listed under Part IV, Item 15 in this report. Our management, with the participation of our Chief Executive Officer and Chief Financial Officer, has evaluated the effectiveness of our disclosure controls and procedures as of October 3, 2015, and, based on their evaluation, our Chief Executive Officer and Chief Financial Officer have concluded that these controls and procedures were effective at the evaluation date. Disclosure controls and procedures are controls and other procedures that are designed to reasonably assure that information required to be disclosed in the reports that we file or submit under the Exchange Act is recorded, processed, summarized and reported within the time periods specified in the Securities and Exchange Commission’s rules and forms. Disclosure controls and procedures include, without limitation, controls and procedures designed to ensure that information that we are required to disclose in the reports that we file or submit under the Exchange Act is accumulated and communicated to our management, including our Chief Executive Officer and Chief Financial Officer, as appropriate to allow timely decisions regarding required disclosure. Management of Delta Apparel, Inc. is responsible for establishing and maintaining effective internal control over financial reporting as defined in Rules 13a-15(f) under the Securities Exchange Act of 1934. Our internal control over financial reporting is designed to provide reasonable assurance regarding the preparation and fair presentation of published financial statements. Because of its inherent limitations, internal control over financial reporting may not prevent or detect misstatements. Therefore, even those systems determined to be effective can provide only reasonable assurance with respect to financial statement preparation and presentation. ("COSO") in Internal Control – Integrated Framework. The scope of our efforts to comply with the internal requirements of Section 404 of the Sarbanes-Oxely Act of 2002 with respect to fiscal year 2015 included all of our operations. Based on our evaluation, our management has concluded that, as of October 3, 2015, our internal control over financial reporting is effective. The effectiveness of our internal control over financial reporting as of October 3, 2015, has been audited by KPMG LLP, our independent registered public accounting firm, who also audited our Consolidated Financial Statements. KPMG’s attestation report on our internal controls over financial reporting is included herein. There was no change in our internal control over financial reporting during the fourth quarter of fiscal year 2015 that has materially affected, or is reasonably likely to materially affect, our internal control over financial reporting. We have audited Delta Apparel, Inc.’s internal control over financial reporting as of October 3, 2015, based on criteria established in Internal Control - Integrated Framework (2013) issued by the Committee of Sponsoring Organizations of the Treadway Commission (COSO). Delta Apparel, Inc.’s management is responsible for maintaining effective internal control over financial reporting and for its assessment of the effectiveness of internal control over financial reporting, included in the accompanying Management’s Annual Report on Internal Control over Financial Reporting. Our responsibility is to express an opinion on the Company’s internal control over financial reporting based on our audit. In our opinion, Delta Apparel, Inc. maintained, in all material respects, effective internal control over financial reporting as of October 3, 2015, based on criteria established in Internal Control - Integrated Framework (2013) issued by the Committee of Sponsoring Organizations of the Treadway Commission (COSO). We also have audited, in accordance with the standards of the Public Company Accounting Oversight Board (United States), the consolidated balance sheets of Delta Apparel, Inc. and subsidiaries as of October 3, 2015 and September 27, 2014, and the related consolidated statements of operations, comprehensive income (loss), shareholders’ equity, and cash flows for each of the years then ended and the 13-week transition period ended September 28, 2013, and our report dated December 15, 2015 expressed an unqualified opinion on those consolidated financial statements. On December 11, 2015, the Company and Parkdale entered into a Fourth Amendment to Yarn Supply Agreement (the "Fourth Amendment"). The Fourth Amendment amends the terms of the Yarn Supply Agreement dated as of January 5, 2005, between the Company and Parkdale (the "Yarn Supply Agreement"), which was previously amended by the First Amendment to Yarn Supply Agreement dated as of June 26, 2009 (the "First Amendment"), the Second Amendment to Yarn Supply Agreement dated as of October 21, 2011 (the “Second Amendment”), and the Third Amendment to Yarn Supply Agreement dated as of March 11, 2013 (the “Third Amendment”). Pursuant to the Yarn Supply Agreement, as amended, the Company purchases from Parkdale all yarn required by the Company and its wholly owned subsidiaries for use in its manufacturing operations (excluding yarns that Parkdale did not manufacture as of the date of the Yarn Supply Agreement in the ordinary course of its business or due to temporary Parkdale capacity restraints). Pursuant to the Fourth Amendment, the term of the Yarn Supply Agreement was extended until December 31, 2018. In addition, certain waste factors and conversion prices used to calculate the price of yarn purchased pursuant to the Yarn Supply Agreement were amended, with the new waste factors and pricing effective January 1, 2016. The foregoing description of the Fourth Amendment is not complete and is qualified in its entirety by the actual provisions of the Fourth Amendment, a copy of which is filed as an exhibit to this Annual Report on Form 10-K (with portions omitted pursuant to a request for confidential treatment and which have been filed separately with the Securities and Exchange Commission) and incorporated herein by reference. The Yarn Supply Agreement was filed as Exhibit 10.29 to the Company's Quarterly Report on Form 10-Q filed on February 9, 2005, the First Amendment was filed as Exhibit 10.7.1 to the Company's Annual Report on Form 10-K filed on August 28, 2009, the Second Amendment was filed as Exhibit 10.1 to the Company's Current Report on Form 8-K filed on October 25, 2011, and the Third Amendment was filed as Exhibit 10.1 to the Company's Current Report on Form 8-K filed on March 14, 2013. The Yarn Supply Agreement, the First Amendment, the Second Amendment and the Third Amendment are incorporated herein by reference. All of our employees, including our Chief Executive Officer and Chief Financial Officer (who is also our principal accounting officer), are required to abide by our business conduct policies so that our business is conducted in a consistently legal and ethical manner. We have adopted a code of business conduct and ethics known as our Ethics Policy Statement. The Ethics Policy Statement is available without charge on our website. In the event that we amend or waive any of the provisions of the Ethics Policy Statement applicable to our Chief Executive Officer or Chief Financial Officer, we intend to disclose the same on our website at www.deltaapparelinc.com. The information relating to security ownership by certain beneficial owners and management is incorporated herein by reference from the portion of the definitive Proxy Statement to be filed with the Securities and Exchange Commission within 120 days following the end of our 2015 fiscal year under the heading “Stock Ownership of Management and Principal Shareholders." On November 11, 2010, the Delta Apparel, Inc. shareholders approved the Delta Apparel, Inc. 2010 Stock Plan ("2010 Stock Plan"). Upon shareholder approval of the 2010 Stock Plan, no additional awards have been or will be granted under either the Delta Apparel Stock Option Plan ("Option Plan") or the Delta Apparel Incentive Stock Award Plan ("Award Plan"); instead, all stock awards have and will be granted under the 2010 Stock Plan. The aggregate number of shares of common stock that may be delivered under the 2010 Stock Plan is 500,000 plus any shares of common stock subject to outstanding awards under the Option Plan or Award Plan that are subsequently forfeited or terminated for any reason before being exercised. The 2010 Stock Plan limits the number of shares that may be covered by awards to any participant in a given calendar year and also limits the aggregate awards of restricted stock, restricted stock units and performance stock granted in any given calendar year. Set forth in the table below is certain information about securities issuable under our equity compensation plans as of October 3, 2015. For additional information on our stock-based compensation plans, see Note 12 - Employee Benefit Plans to the Consolidated Financial Statements. The information required by this Item is incorporated herein by reference from the portion of the definitive Proxy Statement to be filed with the Securities and Exchange Commission within 120 days following the end of our 2015 fiscal year under the headings “Related Party Transactions” and "Corporate Governance". The information required by this Item is incorporated herein by reference from the portion of the definitive Proxy Statement to be filed with the Securities and Exchange Commission within 120 days following the end of our 2015 fiscal year under the heading “Proposal No. 4: Ratification of Appointment of Independent Registered Public Accounting Firm”. Reports of Independent Registered Public Accounting Firms. Consolidated Balance Sheets as of October 3, 2015, and September 27, 2014. Consolidated Statements of Operations for the years ended October 3, 2015 and September 27, 2014, 13-week transition period ended September 28, 2013, and for the year ended June 29, 2013. Consolidated Statements of Comprehensive Income (Loss) for the years ended October 3, 2015 and September 27, 2014, 13-week transition period ended September 28, 2013, and for the year ended June 29, 2013. Consolidated Statements of Shareholders’ Equity for the years ended October 3, 2015 and September 27, 2014, 13-week transition period ended September 28, 2013, and for the year ended June 29, 2013. Consolidated Statements of Cash Flows for the years ended October 3, 2015 and September 27, 2014, 13-week transition period ended September 28, 2013, and for the year ended June 29, 2013. All other schedules for which provision is made in the applicable accounting regulation of the Securities and Exchange Commission are not required under the related instructions or are inapplicable, and therefore have been omitted. Columns omitted from schedules filed have been omitted because the information is not applicable. Amended and Restated Stock Purchase Agreement dated as of October 3, 2003, among Delta Apparel, Inc., MJS Acquisition Company, M. J. Soffe Co., James F. Soffe, John D. Soffe, and Anthony M. Cimaglia (excluding schedules and exhibits): Incorporated by reference to Exhibit 2.1 to the Company’s Form 8-K/A filed on October 17, 2003. First Amendment to Amended and Restated Stock Purchase Agreement dated as of November 10, 2004, among Delta Apparel, Inc., M. J. Soffe Co., James F. Soffe, John D. Soffe, and Anthony M. Cimaglia: Incorporated by reference to Exhibit 2.2.1 to the Company’s Form 10-Q filed on February 9, 2005. Asset Purchase Agreement dated as of August 22, 2005, among Delta Apparel, Inc., Junkfood Clothing Company, Liquid Blaino Designs, Inc. d/b/a Junkfood Clothing, Natalie Grof, and Blaine Halvorson (excluding schedules and exhibits): Incorporated by reference to Exhibit 2.1 to the Company’s Form 8-K filed on August 26, 2005. Asset Purchase Agreement dated as of August 17, 2006, among Delta Apparel, Inc., Fun-Tees, Inc., Henry T. Howe, James C. Poag, Jr., Beverly H. Poag, Lewis G. Reid, Jr., Kurt R. Rawald, Larry L. Martin, Jr., Julius D. Cline and Marcus F. Weibel: Incorporated by reference to Exhibit 2.1 to the Company’s Form 8-K filed on August 21, 2006. Asset Purchase Agreement dated as of November 18, 2004, among Delta Apparel, Inc. and Parkdale America LLC: Incorporated by reference to Exhibit 2.3 to the Company's Form 10-Q filed on February 9, 2005. First Amendment to Asset Purchase Agreement dated as of December 31, 2004, among Delta Apparel, Inc. and Parkdale America LLC: Incorporated by reference to Exhibit 2.3.1 to the Company's Form 10-Q filed on February 9, 2005. Asset Purchase Agreement dated as of August 27, 2013, among To The Game, LLC, Salt Life Holdings, LLC, Roger L. Combs, Sr., Donald R. Combs, Richard Thompson, and Michael T. Hutto (excluding schedules and exhibits): Incorporated by reference to Exhibit 2.1 to the Company’s Form 8-K filed on August 29, 2013. Articles of Incorporation of the Company: Incorporated by reference to Exhibit 3.1 to the Company’s Form 10-12B filed on December 30, 1999. Amendment to Articles of Incorporation of the Company dated September 18, 2003: Incorporated by reference to Exhibit 3.1.2 to the Company’s Form 10-Q filed on November 5, 2003. Amendment to Articles of Incorporation of the Company dated April 28, 2005: Incorporated by reference to Exhibit 3.1.3 to the Company’s Form 8-K filed on April 29, 2005. Amendment to Articles of Incorporation of the Company dated November 8, 2007: Incorporated by reference to Exhibit 3.1.4 to the Company’s Form 10-K filed on August 28, 2009. Bylaws of the Company: Incorporated by reference to Exhibit 3.2.1 to the Company’s Form 10-K filed on August 28, 2009. Amendment to Bylaws of the Company adopted January 20, 2000: Incorporated by reference to Exhibit 3.2.2 to the Company’s Form 10-K filed on August 28, 2009. Amendment to Bylaws of the Company adopted February 17, 2000: Incorporated by reference to Exhibit 3.2.3 to the Company’s Form 10-K filed on August 28, 2009. Amendment to Bylaws of the Company adopted June 6, 2000: Incorporated by reference to Exhibit 3.2.4 to the Company’s Form 10-K filed on August 28, 2009. Amendment to Bylaws dated August 17, 2006: Incorporated by reference to Exhibit 3.2.5 to the Company’s Form 10-K filed on August 28, 2009. Amendment to Bylaws dated August 12, 2009: Incorporated by reference to Exhibit 3.2.6 to the Company’s Form 10-K filed on August 28, 2009. See Exhibits 3.1.1, 3.1.2, 3.1.3, 3.1.4, 3.2.1, 3.2.2, 3.2.3, 3.2.4, 3.2.5, and 3.2.6. Specimen certificate for common stock, par value $0.01 per share, of the Company: Incorporated by reference to Exhibit 4.2 to the Company’s Form 10-12 B/A filed on May 3, 2000. See Exhibits 2.1, 2.1.1, 2.2, 2.3, 2.4, 2.4.1 and 2.5. Fourth Amended and Restated Loan and Security Agreement, dated May 27, 2011, among Delta Apparel, Inc., M.J. Soffe, LLC (successor by merger to TCX, LLC), Junkfood Clothing Company, To The Game, LLC, and Art Gun, LLC, the financial institutions named therein as Lenders, Wells Fargo Bank, National Association, as Administrative Agent, Bank of America, N.A., as Syndication Agent, Wells Fargo Capital Finance, LLC, as Sole Lead Arranger, and Wells Fargo Capital Finance, LLC and Merrill Lynch, Pierce, Fenner & Smith Incorporated, as Joint Bookrunners: Incorporated by reference to Exhibit 10.1 to the Company’s Form 8-K filed on June 3, 2011. Consent and First Amendment to Fourth Amended and Restated Loan and Security Agreement, dated August 27, 2013, among Delta Apparel, Inc., M.J. Soffe, LLC (successor by merger to TCX, LLC), Junkfood Clothing Company, To The Game, LLC, and Art Gun, LLC, the financial institutions named therein as Lenders, Wells Fargo Bank, National Association, as Administrative Agent, Bank of America, N.A., as Syndication Agent, Wells Fargo Capital Finance, LLC, as Sole Lead Arranger, and Wells Fargo Capital Finance, LLC and Merrill Lynch, Pierce, Fenner & Smith Incorporated, as Joint Bookrunners: Incorporated by reference to Exhibit 10.1 to the Company’s Form 8-K filed on August 29, 2013. Third Amendment to Fourth Amended and Restated Loan and Security Agreement, dated September 26, 2014, among Delta Apparel, Inc., M.J. Soffe, LLC (successor by merger to TCX, LLC), Junkfood Clothing Company, To The Game, LLC, and Art Gun, LLC, the financial institutions named therein as Lenders, Wells Fargo Bank, National Association, as Administrative Agent, Bank of America, N.A., as Syndication Agent, Wells Fargo Capital Finance, LLC, as Sole Lead Arranger, and Wells Fargo Capital Finance, LLC and Merrill Lynch, Pierce, Fenner & Smith Incorporated, as Joint Bookrunners: Incorporated by reference to Exhibit 10.1 to the Company’s Form 8-K filed on October 1, 2014. Fourth Amendment to Fourth Amended and Restated Loan and Security Agreement, dated February 27, 2015, among Delta Apparel, Inc., M.J. Soffe, LLC (successor by merger to TCX, LLC), Junkfood Clothing Company, To The Game, LLC, and Art Gun, LLC, the financial institutions named therein as Lenders, Wells Fargo Bank, National Association, as Administrative Agent, Bank of America, N.A., as Syndication Agent, Wells Fargo Capital Finance, LLC, as Sole Lead Arranger, and Wells Fargo Capital Finance, LLC and Merrill Lynch, Pierce, Fenner & Smith Incorporated, as Joint Bookrunners: Incorporated by reference to Exhibit 10.1 to the Company’s Form 8-K filed on March 4, 2015. Agreement between Delta Apparel, Inc. and IMG Worldwide, Inc. dated December 6, 2013: Incorporated by reference to Exhibit 10.1 to the Company's Form 8-K filed on December 6, 2013. February 13, 2014, Correspondence from Ernst & Young LLP to SEC: Incorporated by reference to Exhibit 16.1 to the Company's Form 8-K filed on February 13, 2014. All reports previously filed by the Company with the Commission pursuant to the Securities Exchange Act, and the rules and regulations promulgated thereunder, exhibits of which are incorporated to this Report by reference thereto, were filed under Commission File Number 1-15583. Portions of this exhibit have been omitted pursuant to a request for confidential treatment and have been filed separately with the Securities and Exchange Commission. The registrant agrees to furnish supplementally to the Securities and Exchange Commission a copy of any omitted schedule or exhibit to any of the above filed exhibits upon request of the Commission. See information under (a)(1) and (2) of Item 15. /s/ Robert E. Staton, Sr.
We have audited the accompanying consolidated balance sheets of Delta Apparel, Inc. and subsidiaries as of October 3, 2015 and September 27, 2014, and the related consolidated statements of operations, comprehensive income (loss), shareholders’ equity, and cash flows for each of the years then ended and the 13-week transition period ended September 28, 2013. In connection with our audits of the consolidated financial statements, we also have audited financial statement schedule II listed in Section 15 (a) (2). These consolidated financial statements and the financial statement schedule are the responsibility of the Company’s management. Our responsibility is to express an opinion on these consolidated financial statements and the financial statement schedule based on our audits. In our opinion, the consolidated financial statements referred to above present fairly, in all material respects, the financial position of Delta Apparel, Inc. and subsidiaries as of October 3, 2015 and September 27, 2014, and the results of their operations and their cash flows for each of the years then ended and the 13-week transition period ended September 28, 2013, in conformity with U.S. generally accepted accounting principles. Also in our opinion, the related financial statement schedule, when considered in relation to the basic consolidated financial statements taken as a whole, presents fairly, in all material respects, the information set forth therein. We also have audited, in accordance with the standards of the Public Company Accounting Oversight Board (United States), Delta Apparel, Inc.’s internal control over financial reporting as of October 3, 2015, based on criteria established in Internal Control - Integrated Framework (2013) issued by the Committee of Sponsoring Organizations of the Treadway Commission (COSO), and our report dated December 15, 2015 expressed an unqualified opinion on the effectiveness of the Company’s internal control over financial reporting. We have audited the accompanying consolidated statements of operations, comprehensive income, shareholders' equity, and cash flows of Delta Apparel, Inc. and subsidiaries for the year ended June 29, 2013. Our audit also included the financial statement schedule for the year ended June 29, 2013 listed in the Index at Item 15(a). These financial statements and schedule are the responsibility of the Company's management. Our responsibility is to express an opinion on these financial statements and schedule based on our audit. In our opinion, the financial statements referred to above present fairly, in all material respects, the consolidated results of operations and cash flows of Delta Apparel, Inc. and subsidiaries for the year ended June 29, 2013, in conformity with U.S. generally accepted accounting principles. Also, in our opinion, the related financial statement schedule, when considered in relation to the basic financial statements taken as a whole, presents fairly, in all material respects, the information for the year ended June 29, 2013 set forth therein.